Sundancer is a curly bay dun stallion with awesome movement. 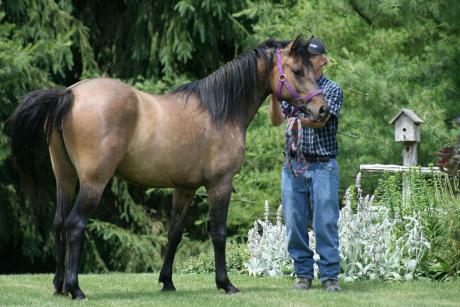 He has endless energy and a confident, friendly temperament. He is very muscular with good bone substance. 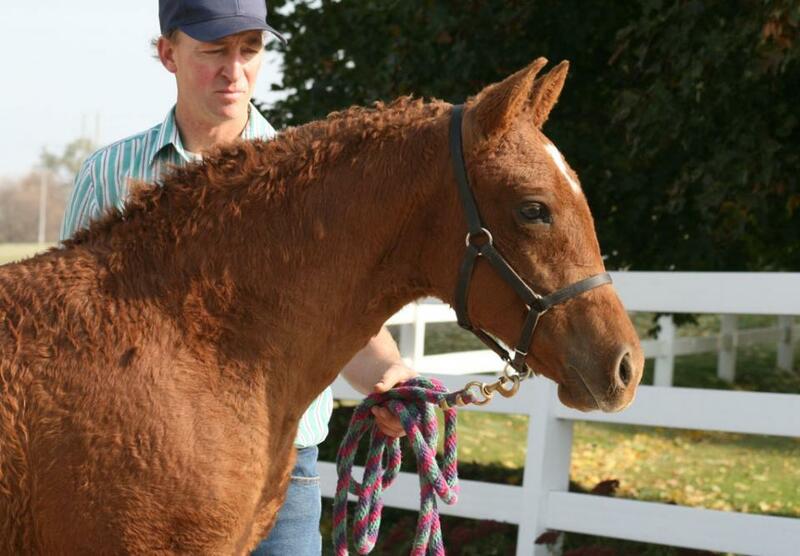 We expect him to be homozygous for curl with his tight micro curl and curled eyelashes. 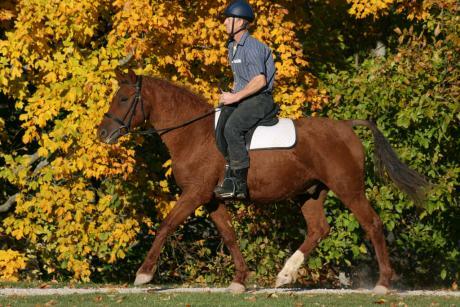 Sundancer would do well crossed with any quality mares and dressage movements should come naturally for him. 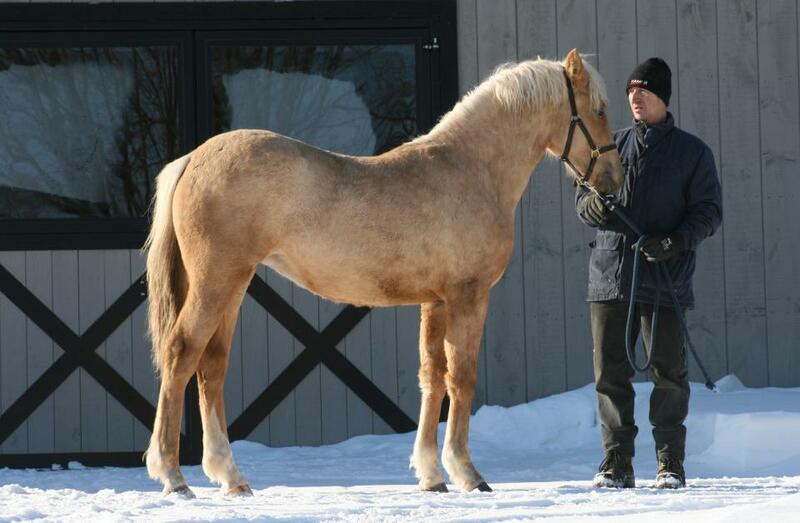 He has a champion dressage sire. 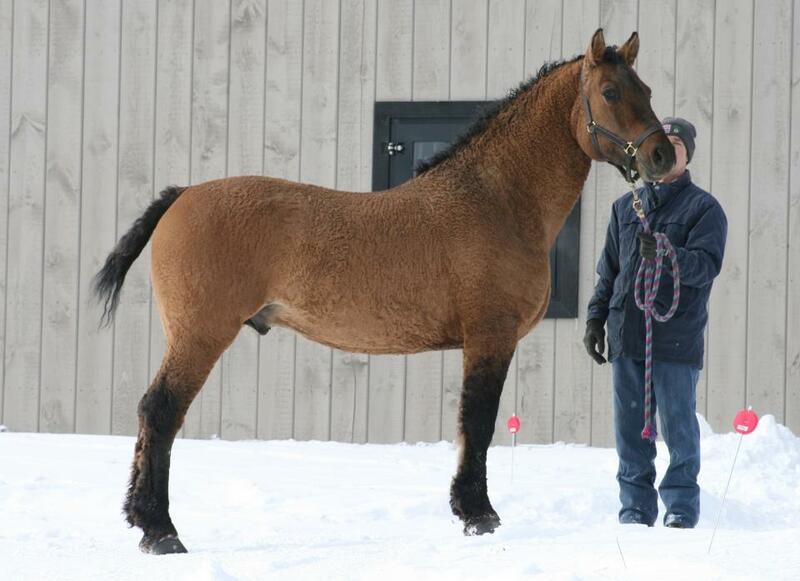 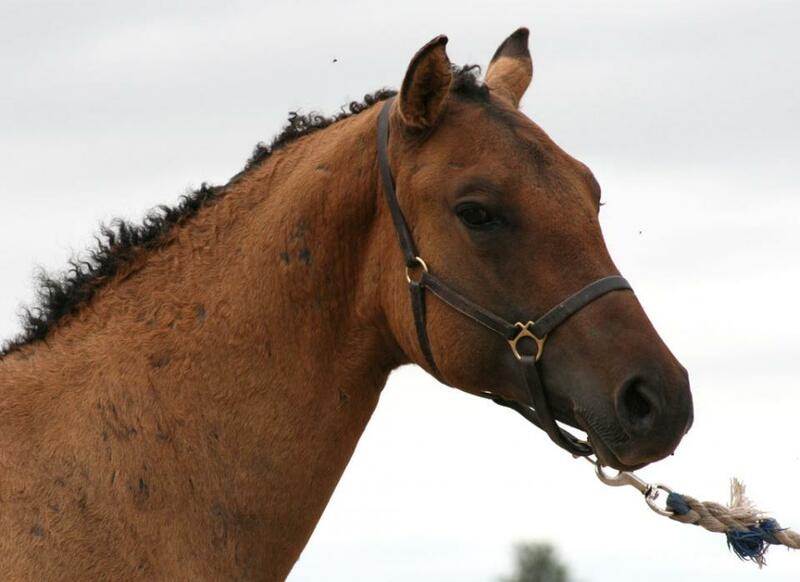 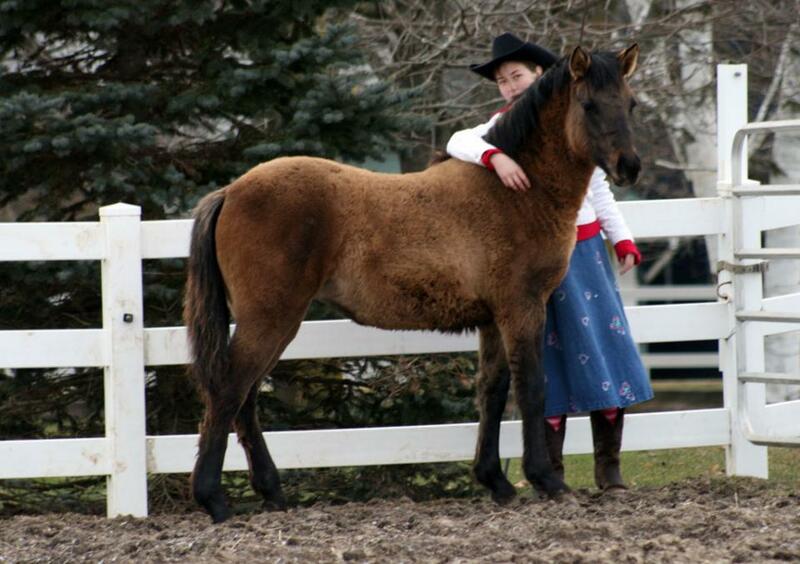 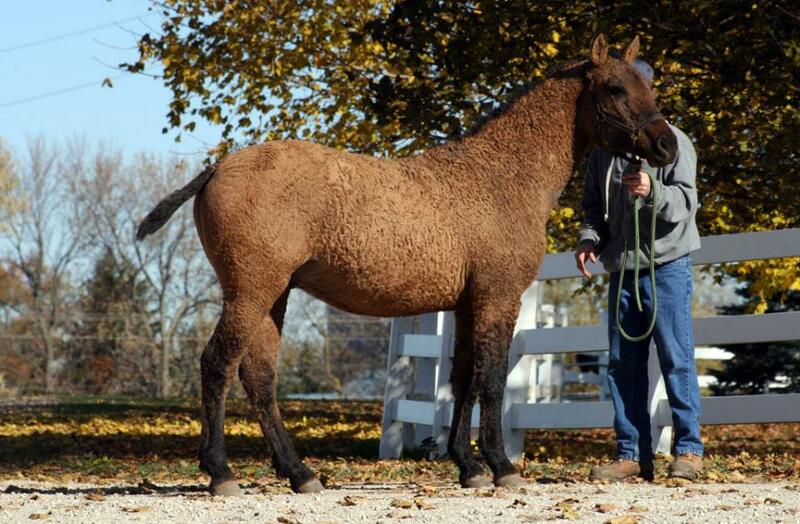 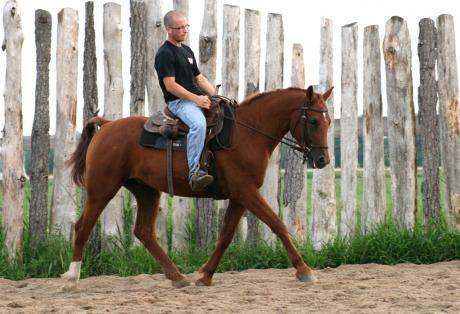 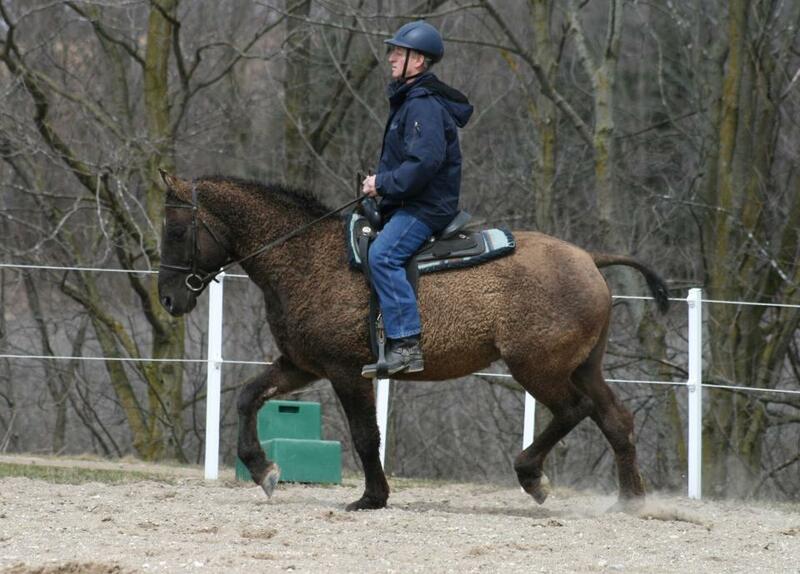 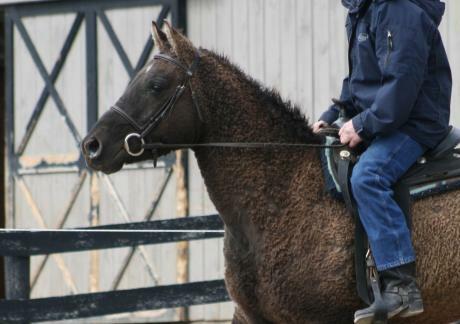 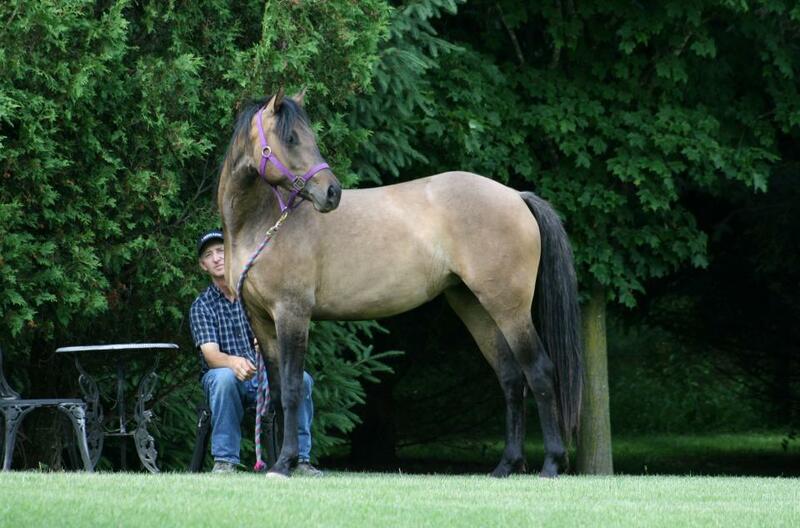 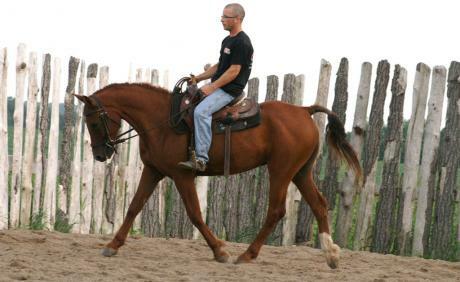 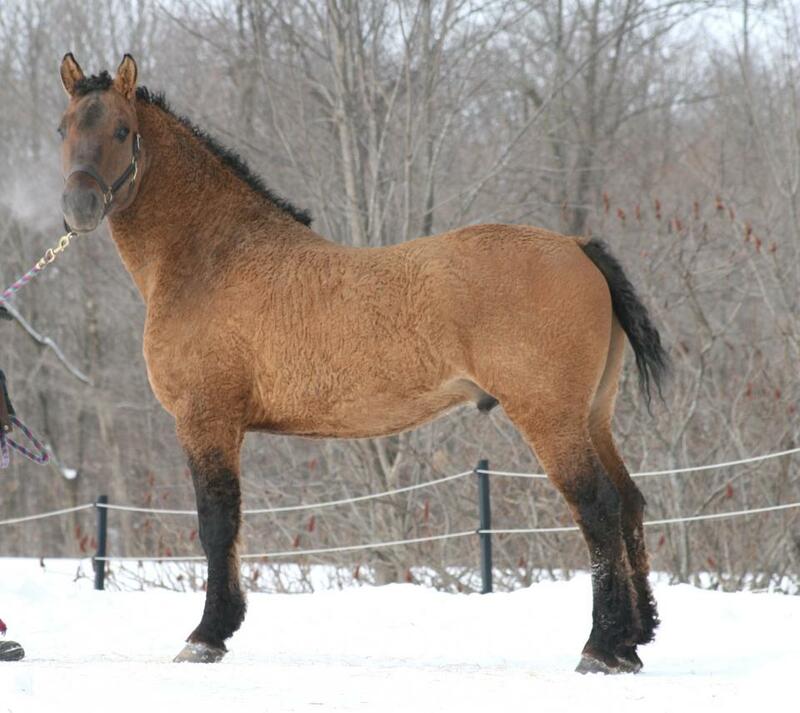 Jasper is a very curly gelding who was started under saddle as a 4 year old by Chet Martin. Jasper had a full four months put on him by this trainer, coming home as a solid, well trained young horse. They did lots of work in the outdoor sand ring doing walk, trot, canter, also working on leg aids, developing a nice frame, and soft mouth. 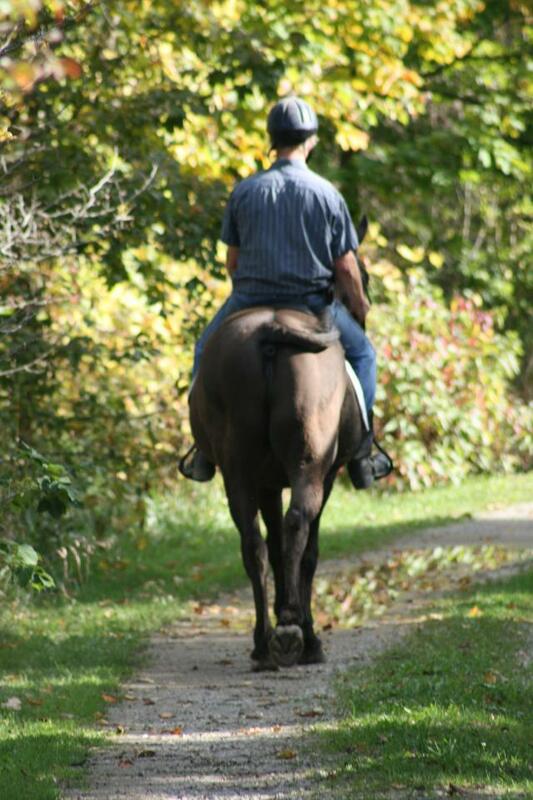 They did lots of trail rides which Jasper enjoys as well. 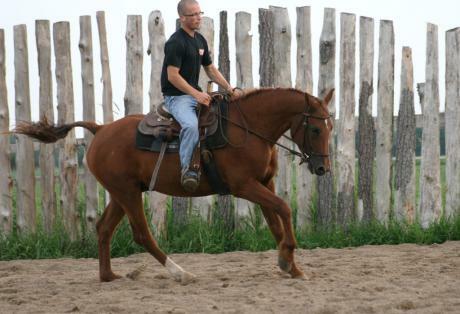 Since then Jasper has been ridden on the trails around our property and sometimes in the arena. 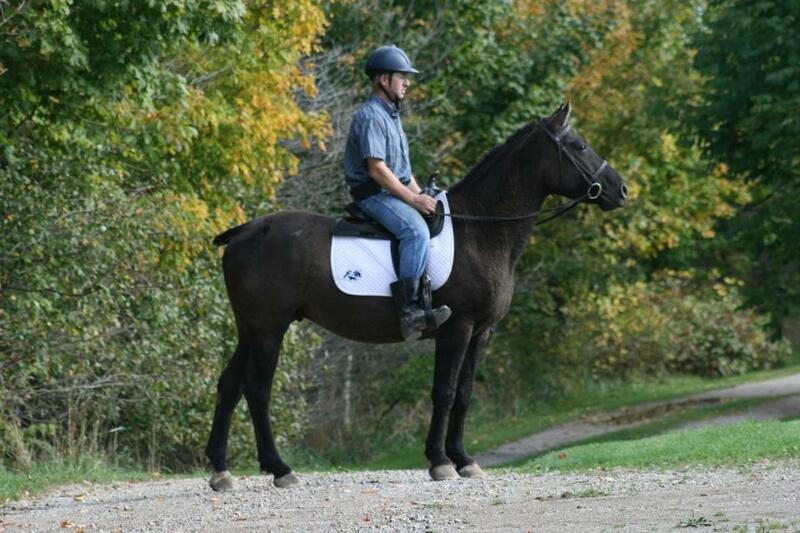 He doesn't mind leaving his other equine friends to take one of his humans for a trail ride or arena work. 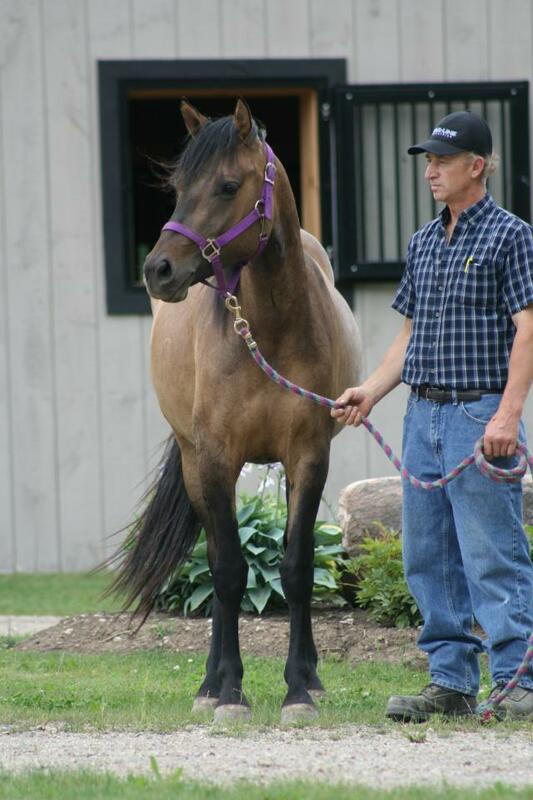 Jasper has a bold, yet kind, gentle temperament with a special presence about him. 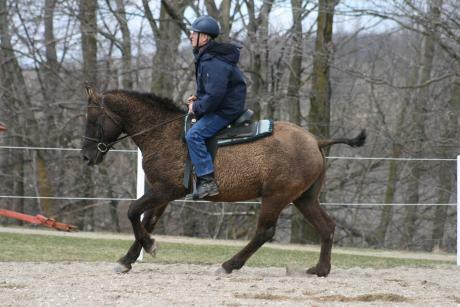 He is put together correctly with lots of reach and suspension in his movement. 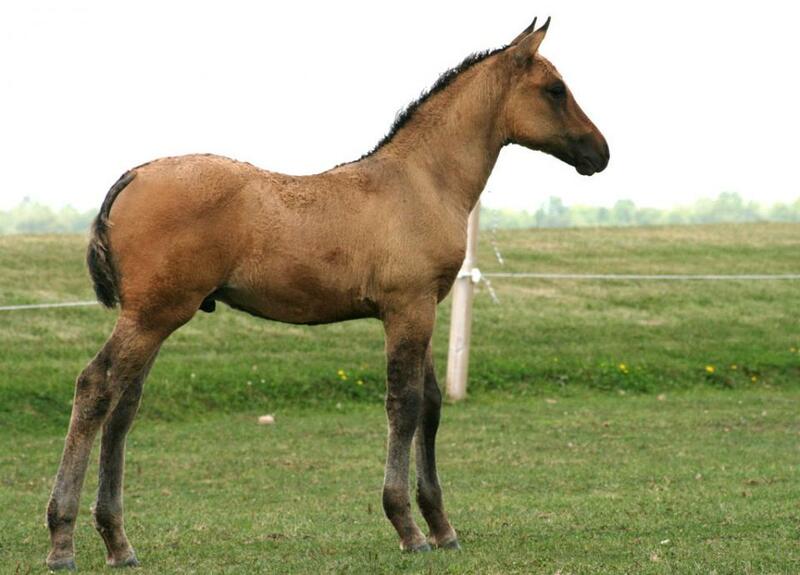 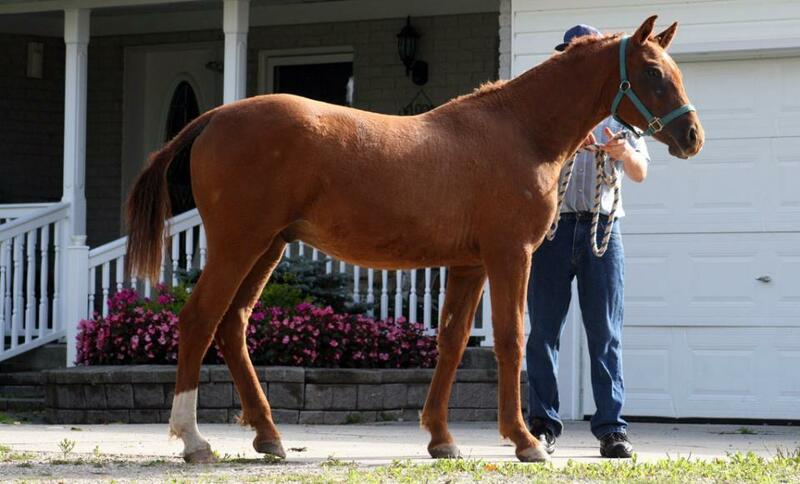 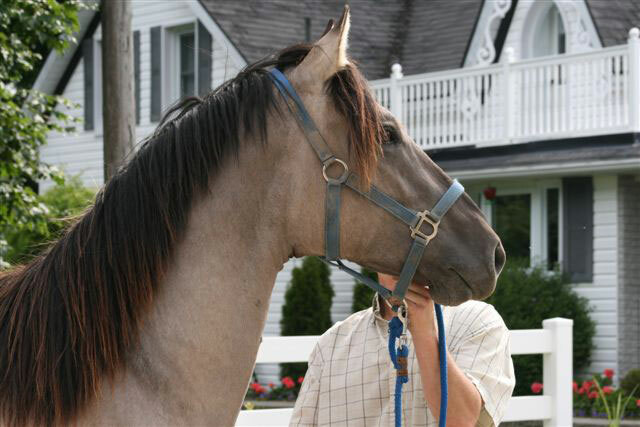 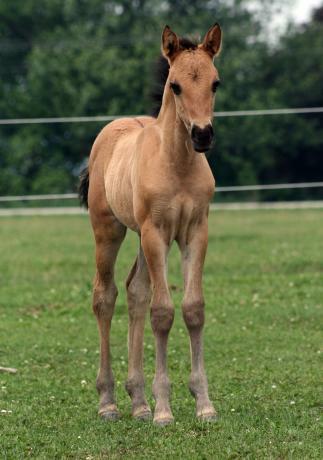 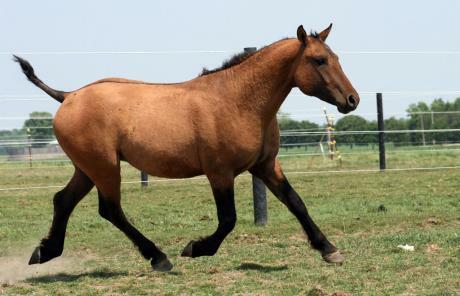 He has a pretty head, good neck length, strong hip, and long legs, which make him well balanced at all three gaits. 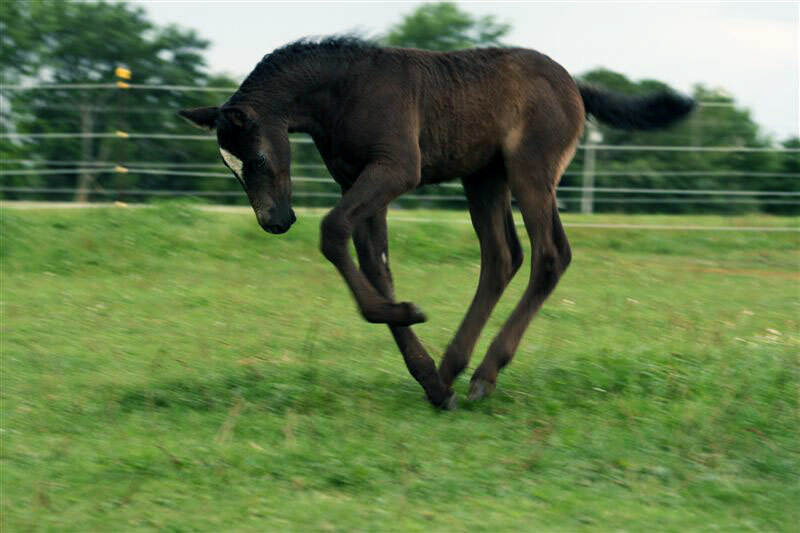 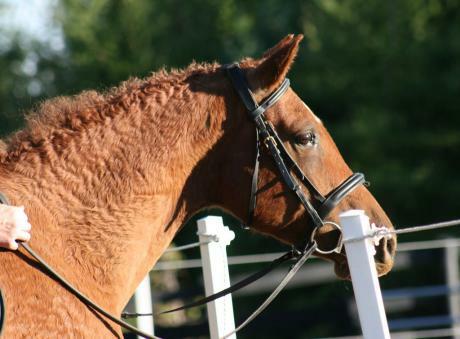 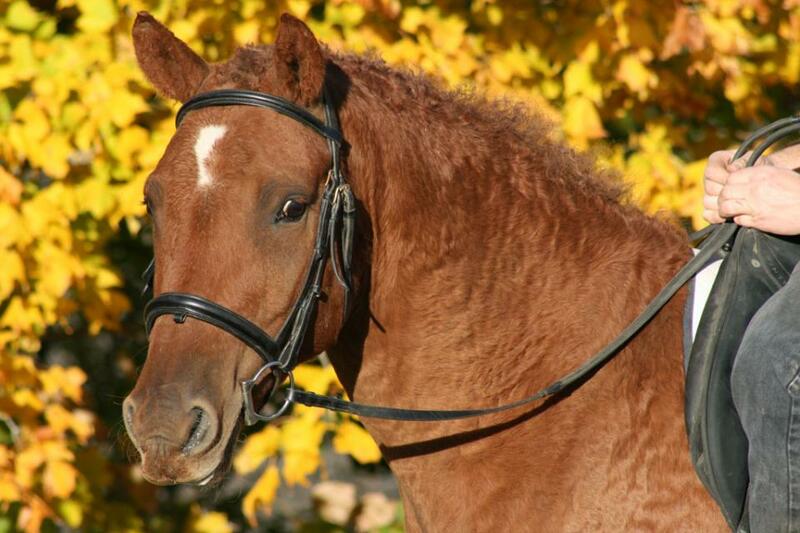 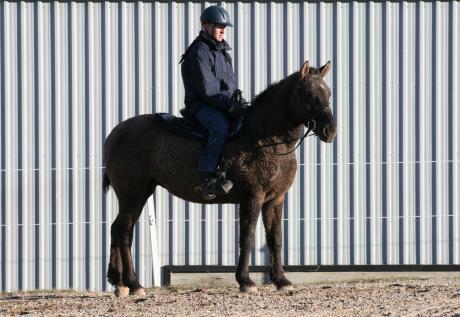 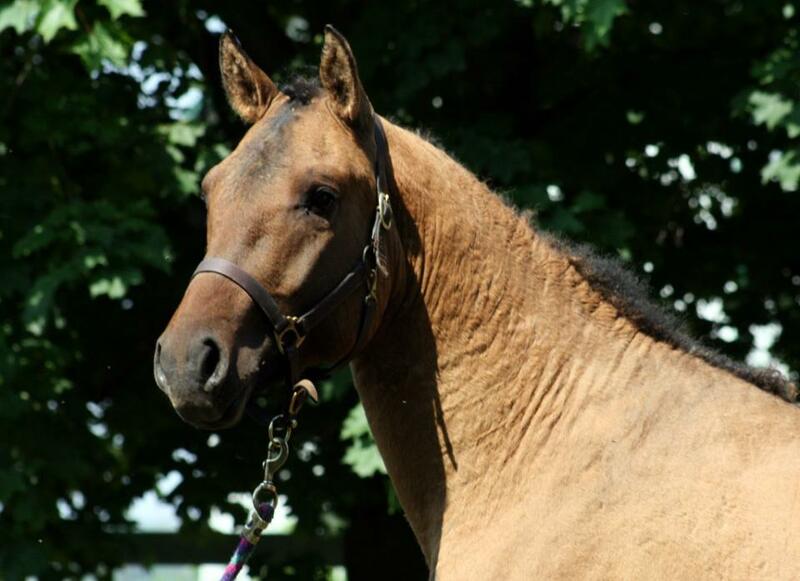 He can be trained further as a sport horse of your choice - dressage, jumping, maybe eventing. He would also make a sound, quiet trail buddy. 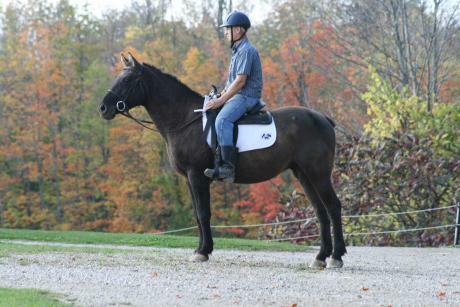 Jasper's dam is a very reliable , sweet, non-spooky trail horse. 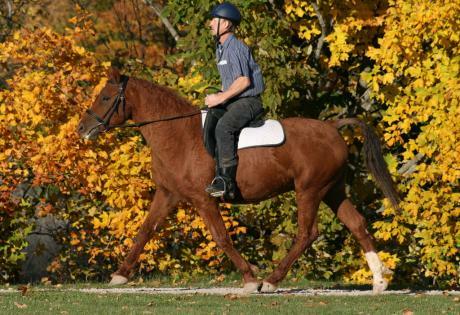 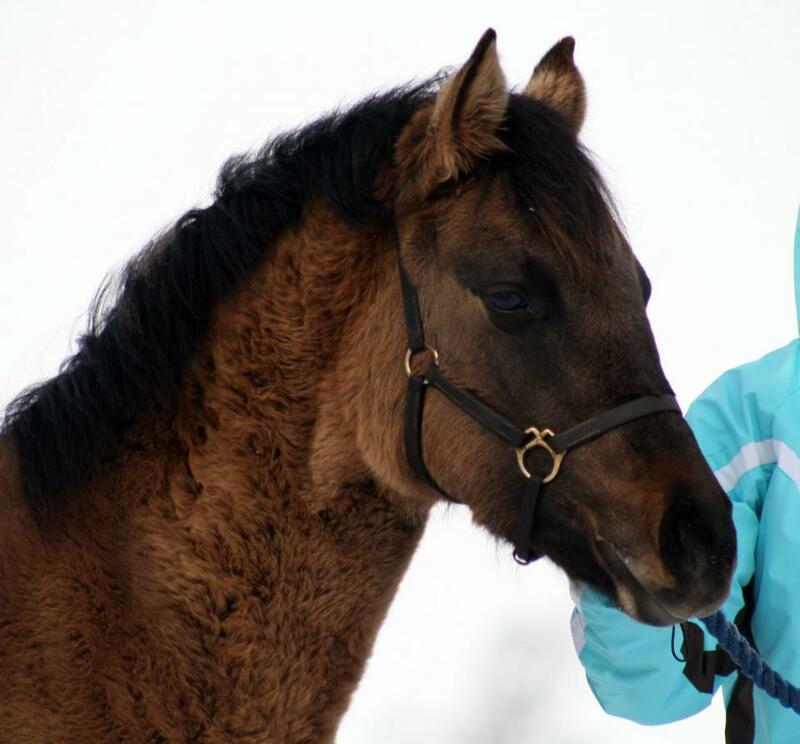 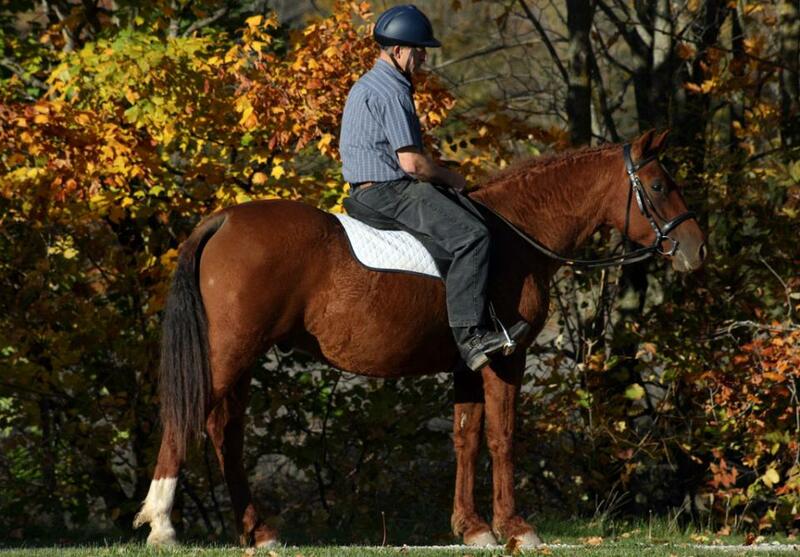 His sire enjoys the trails and also learned quickly while in dressage training. Jasper has a sister which is a competitive jumper in France, who has the same kind temperament, yet also lots of heart to try her best. 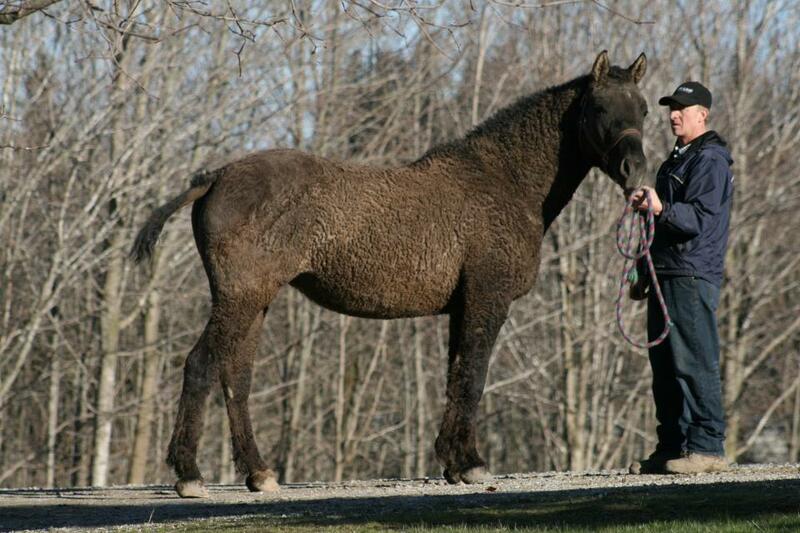 Jasper has the tightly curled coat, curled eyelashes, full Curly parents, so should be good for someone with allergies. 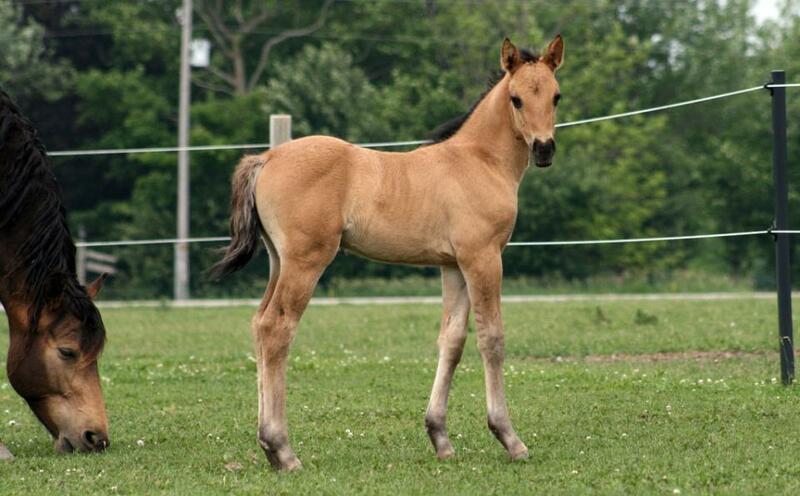 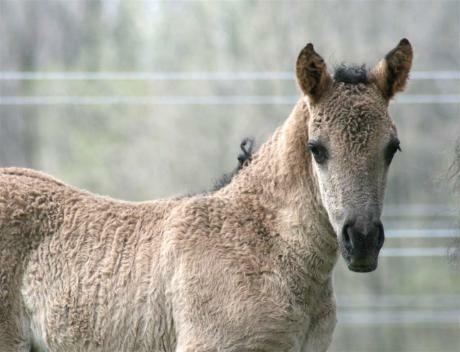 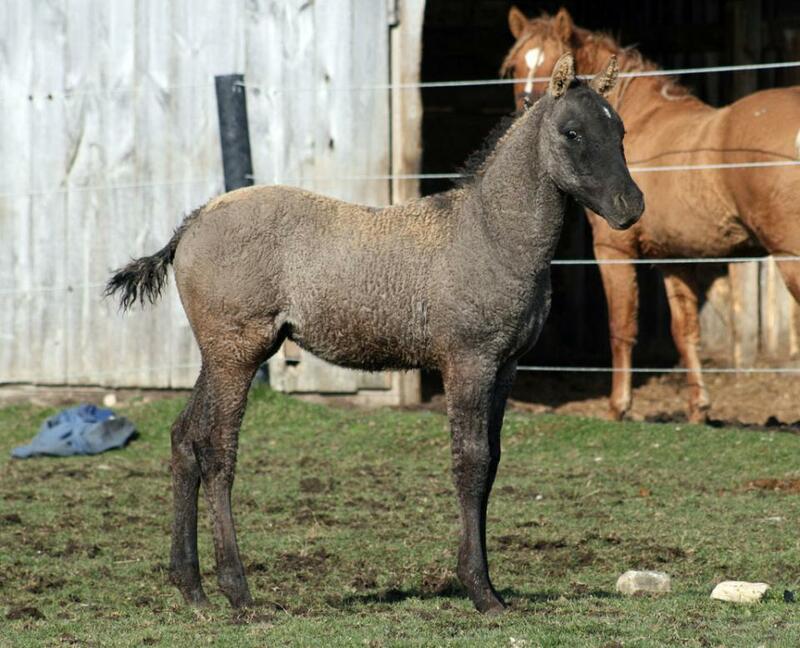 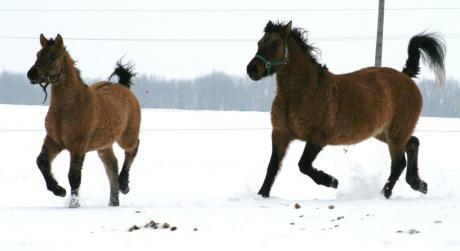 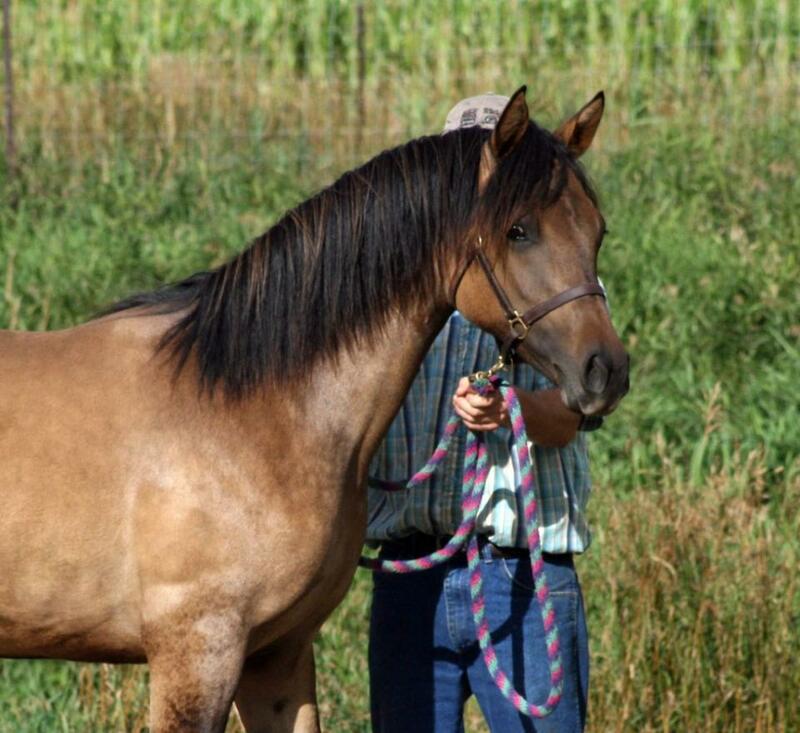 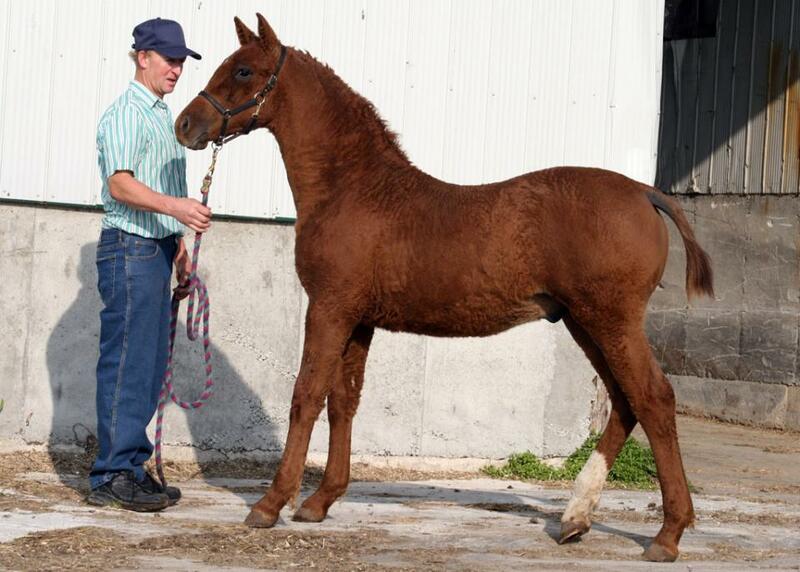 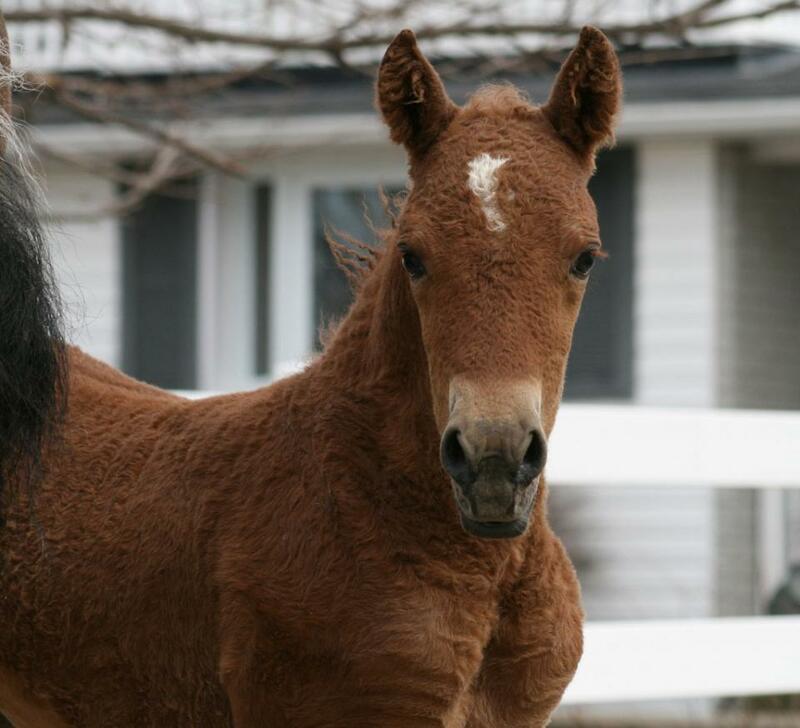 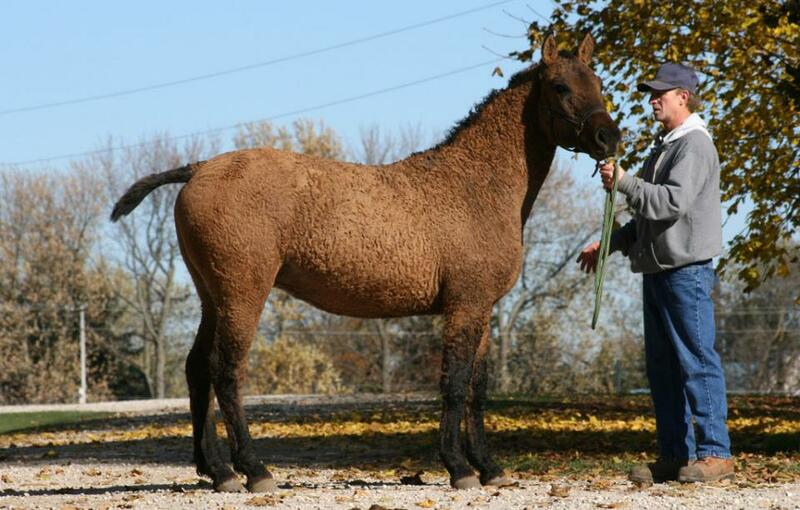 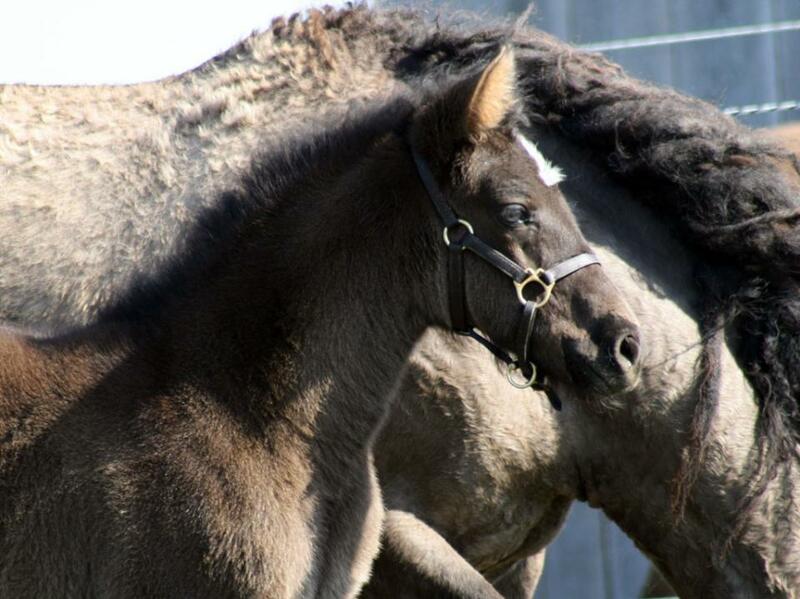 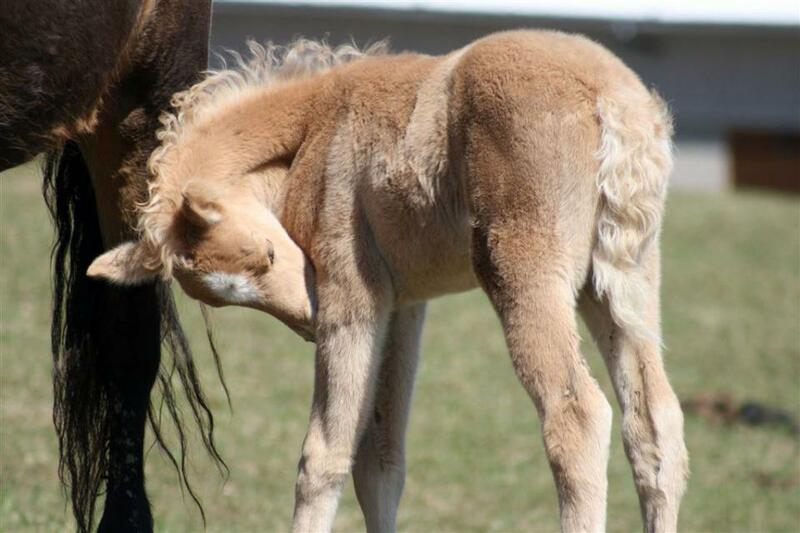 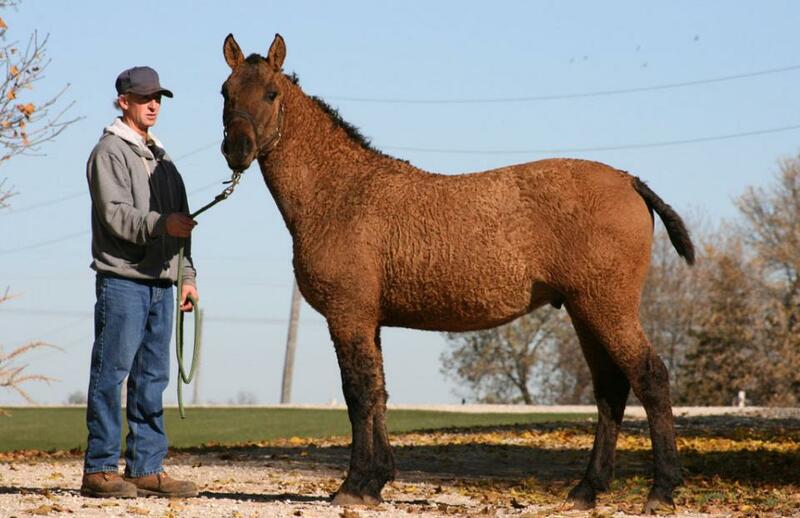 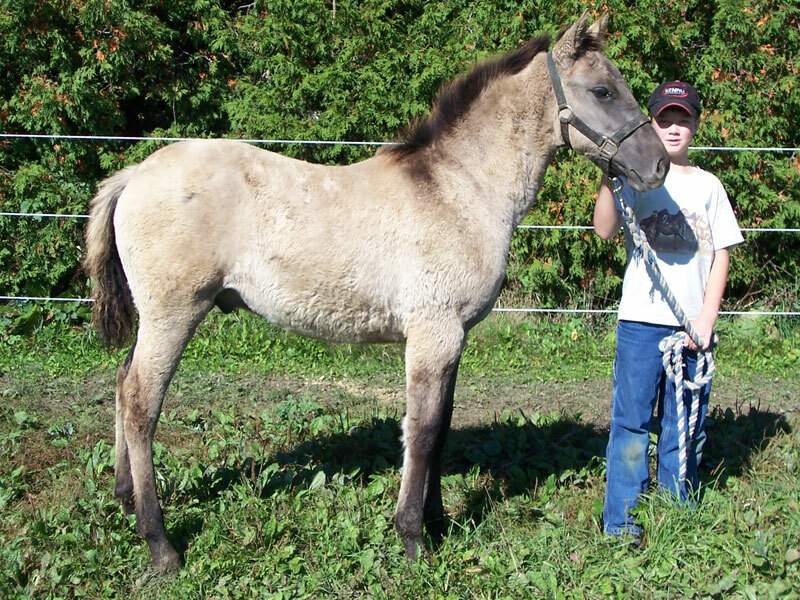 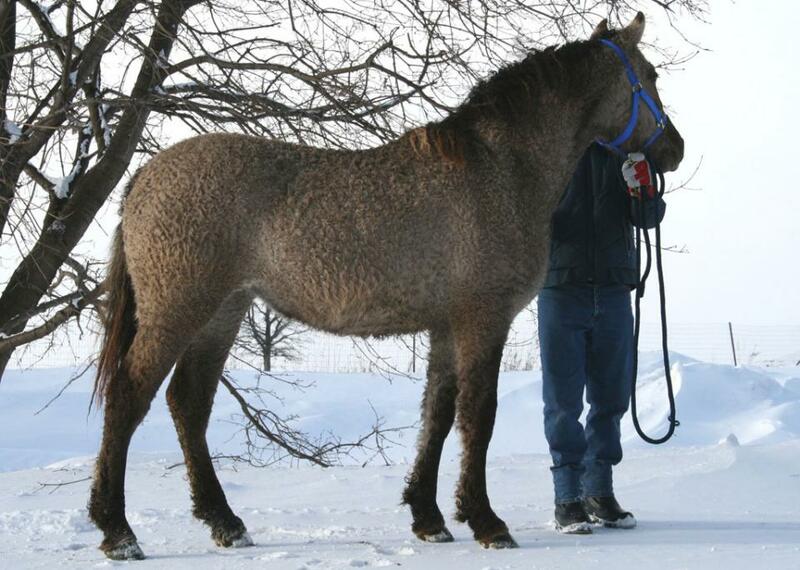 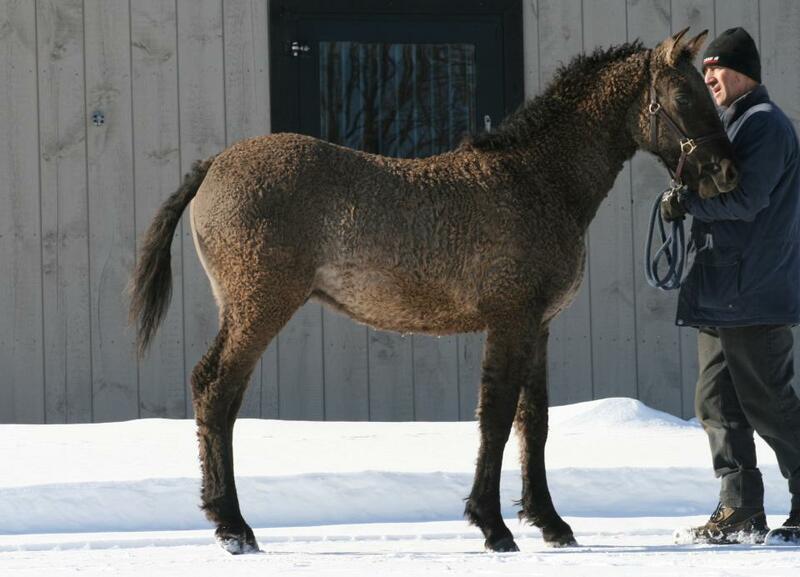 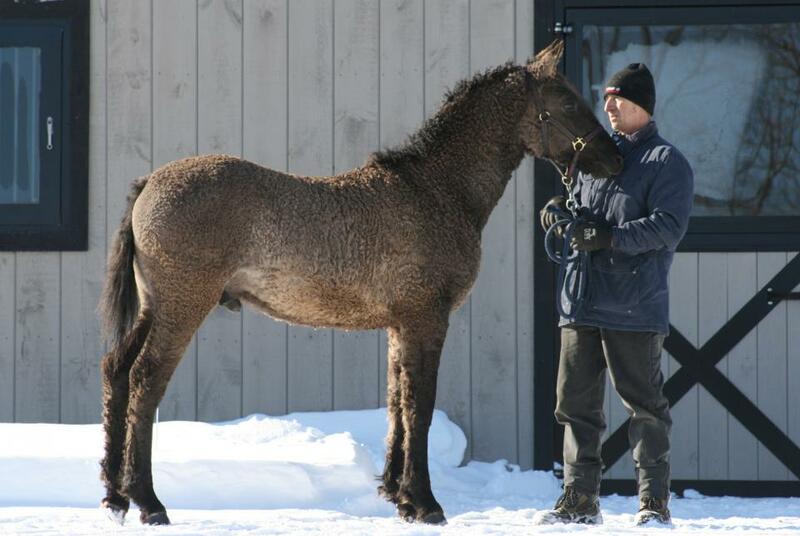 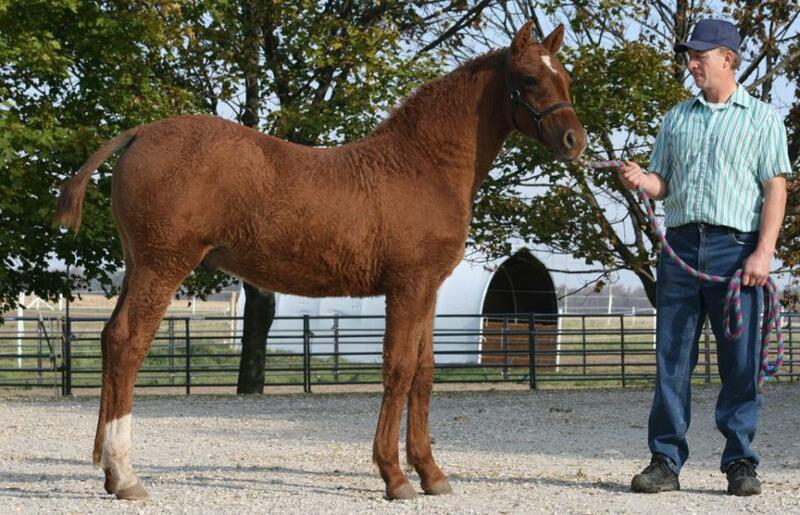 Summer is a straight coated bay dun filly. 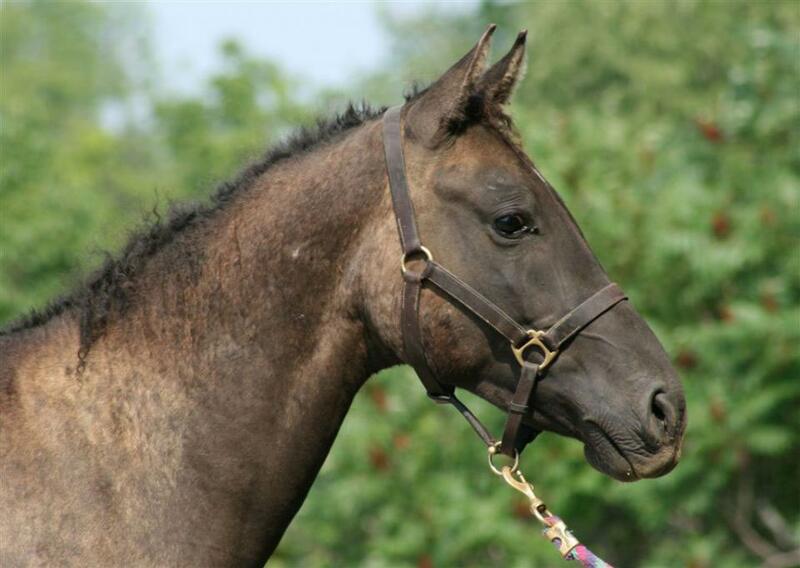 She has the most expressive eyes, a pretty head set on an arched neck, and lovely movement. Summer has a very loving and fun personality. This leggy, refined girl is expected to mature at 15.1 hands. 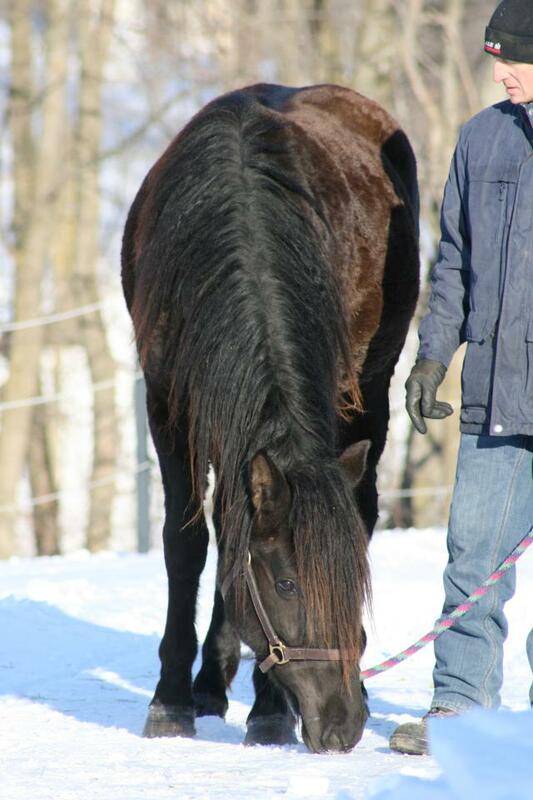 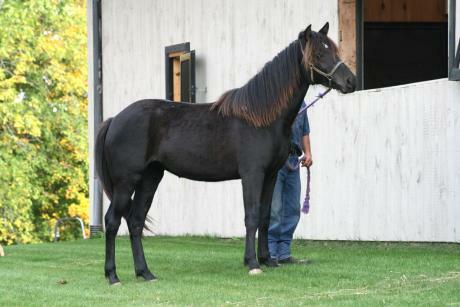 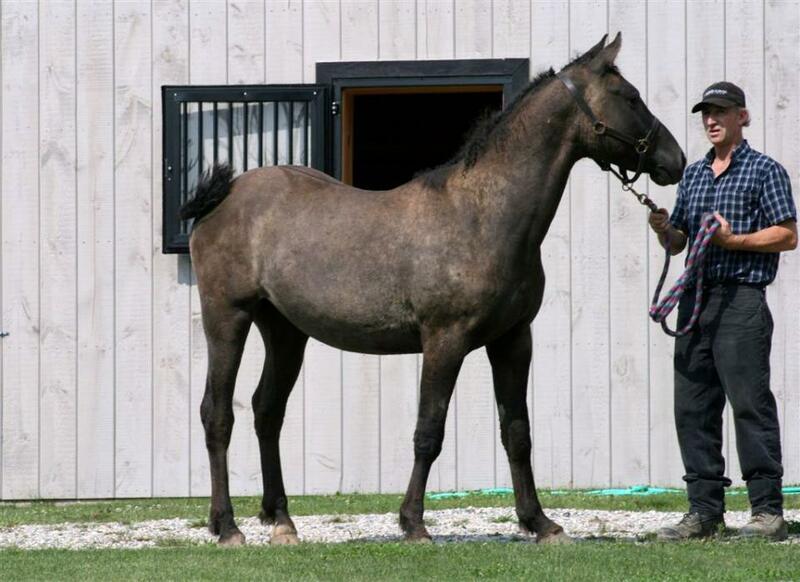 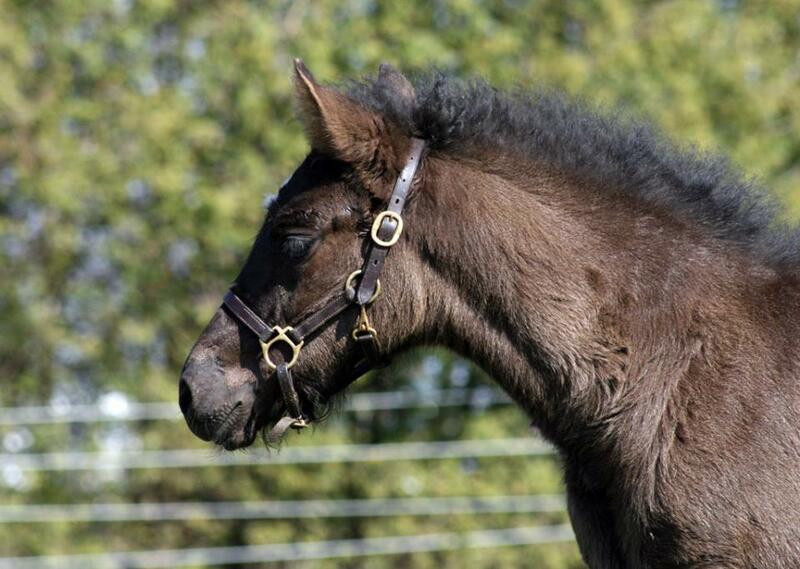 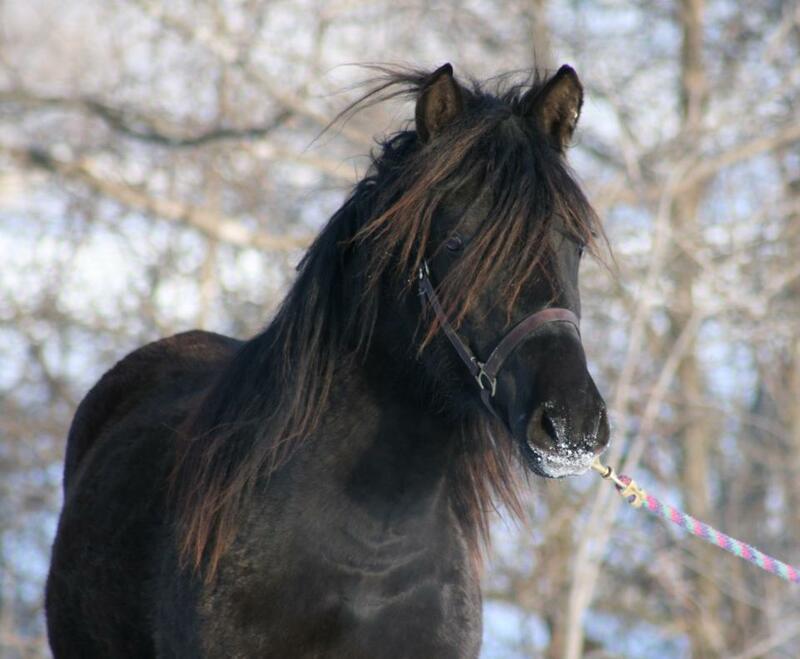 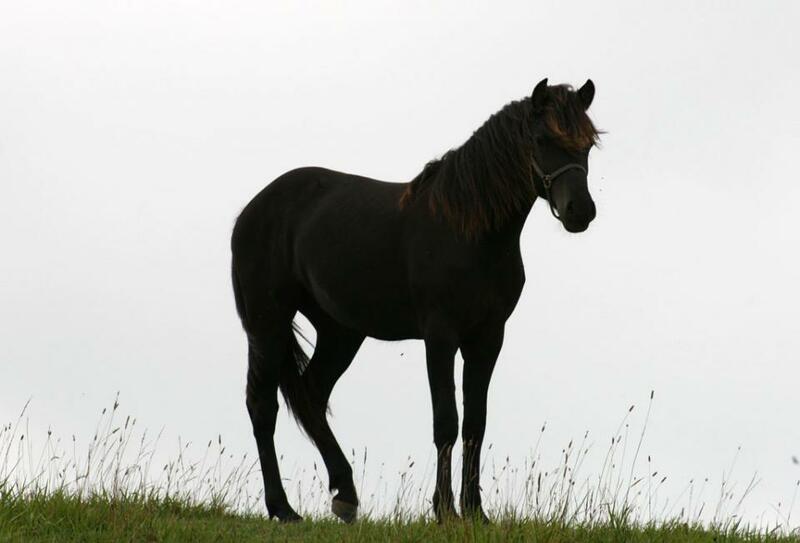 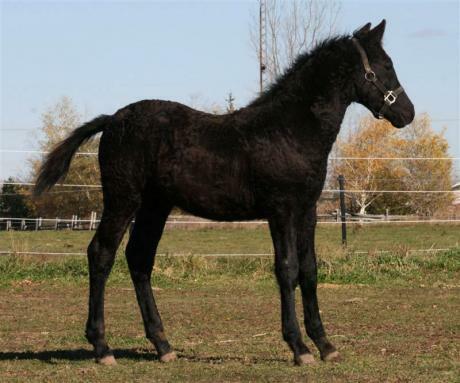 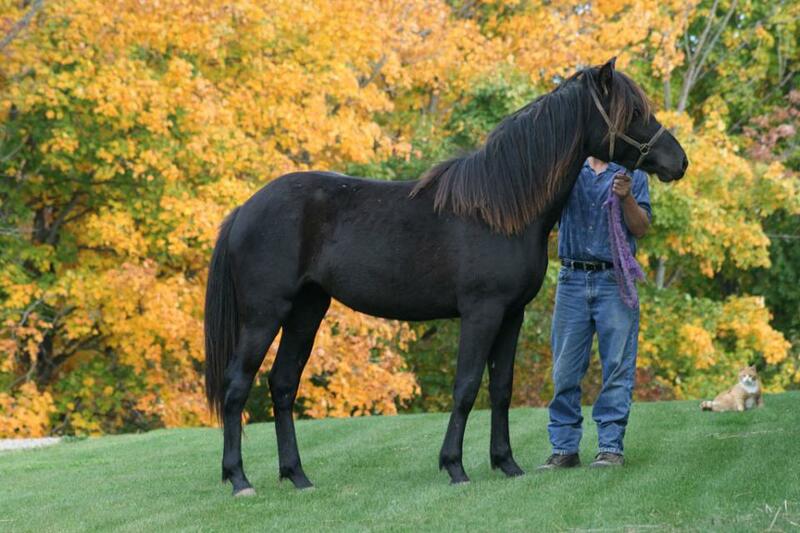 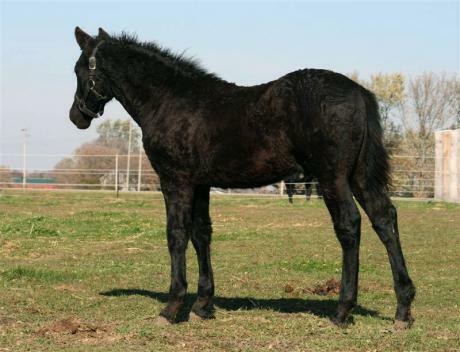 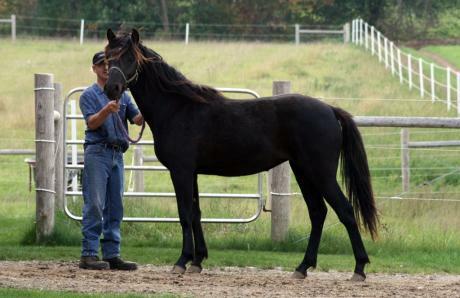 Jade is a tall black filly with a full thick mane and tail. 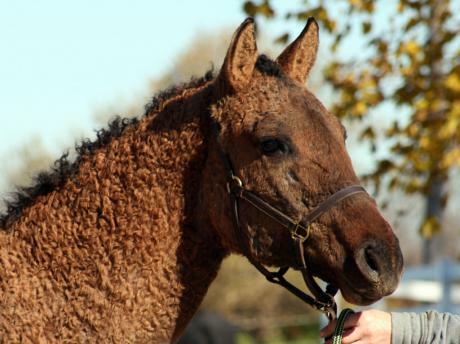 At this time we are not sure if she will be straight coated or a minimal expressed Curly. She has a confident, kind, temperament picking up on the ground work quickly. 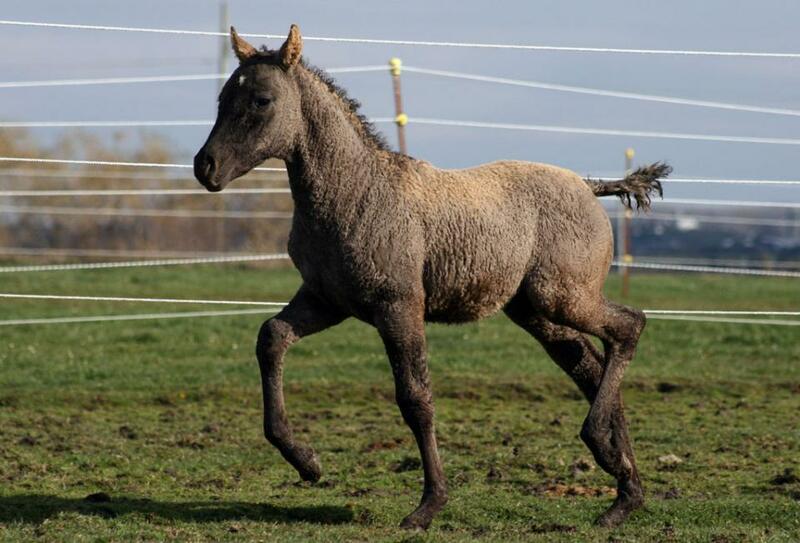 Jade has lots of suspension in her trot moving with poise and style. 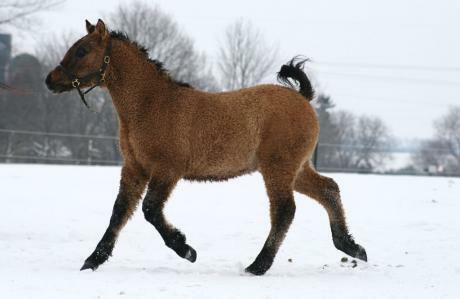 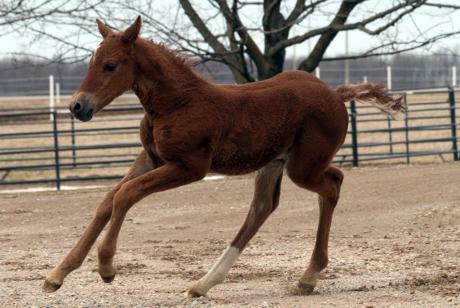 A fine dressage prospect or an asset to a breeding program. Expected height at maturity is 15.2 hands or more. 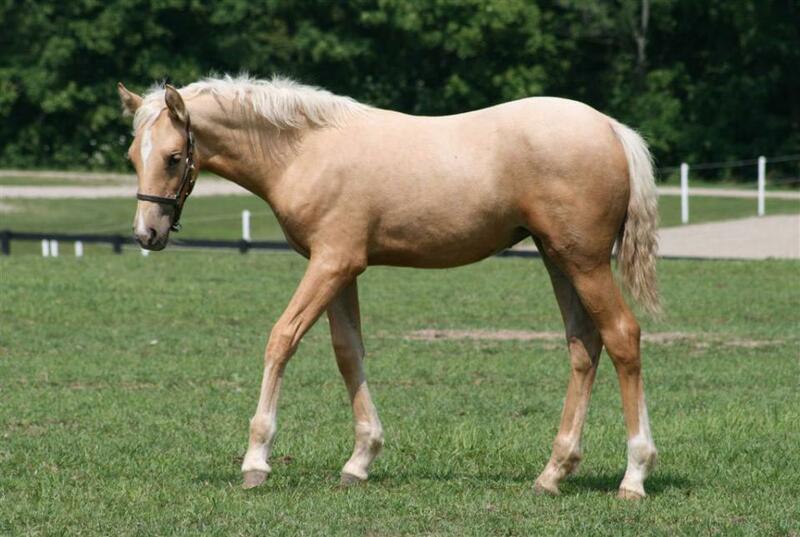 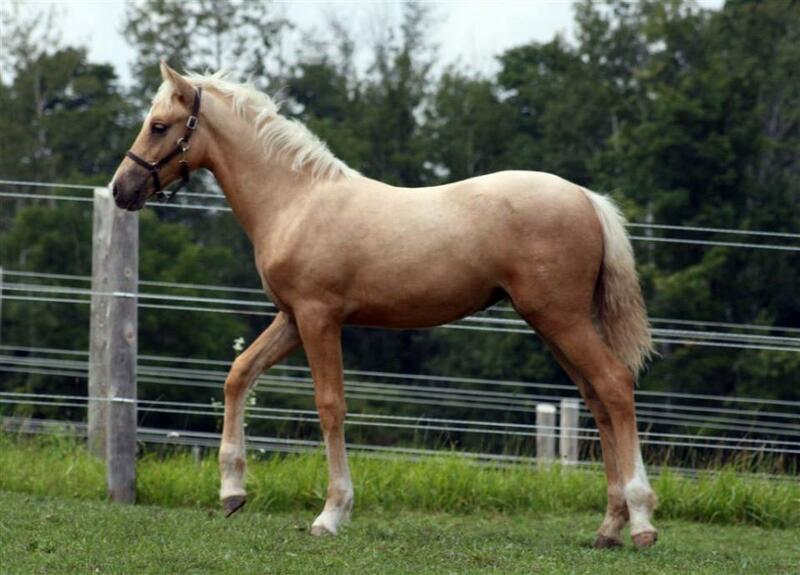 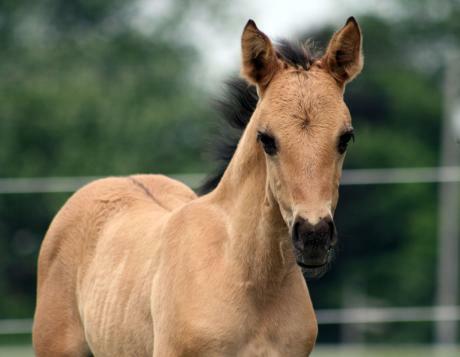 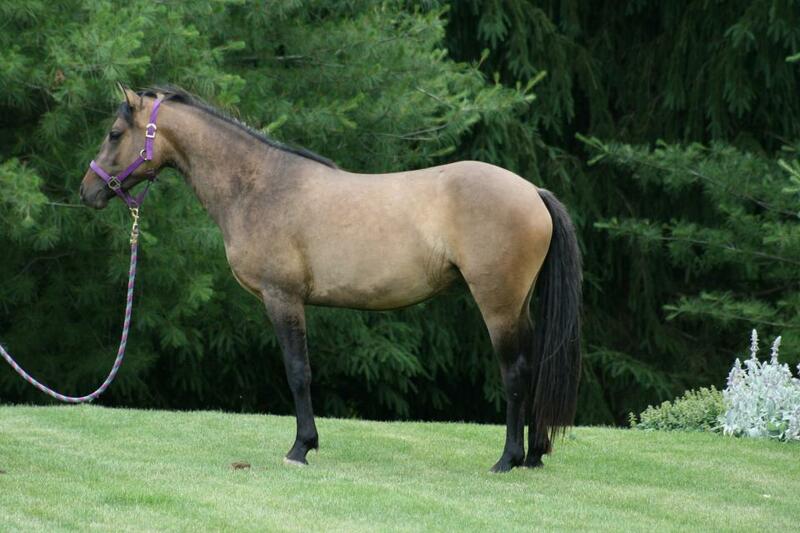 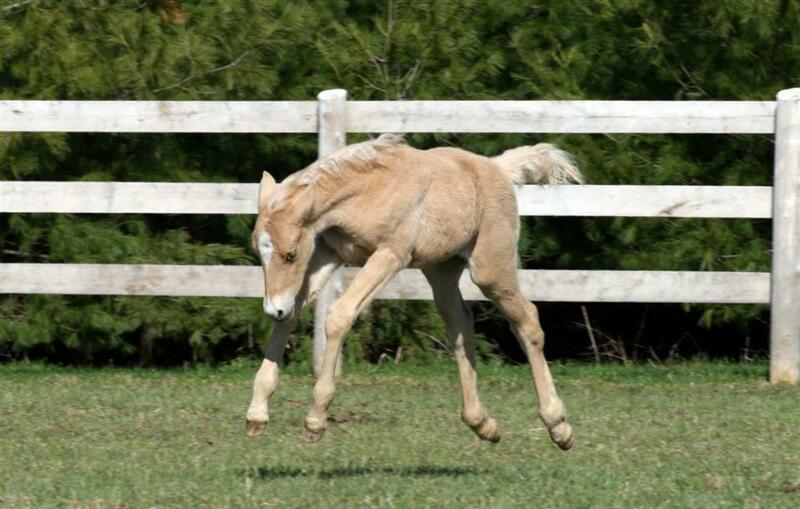 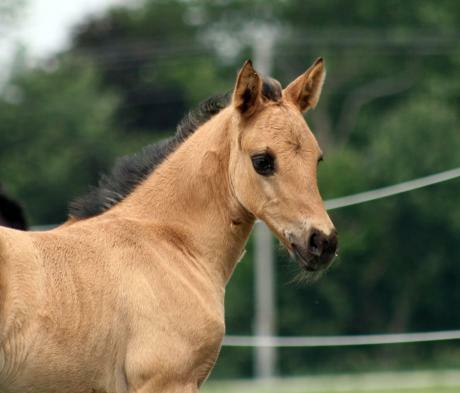 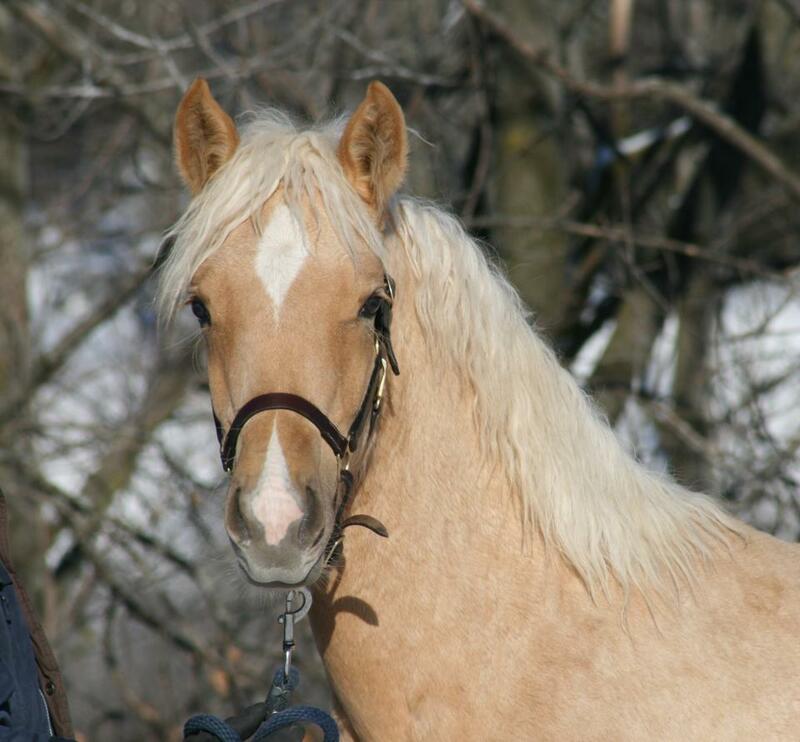 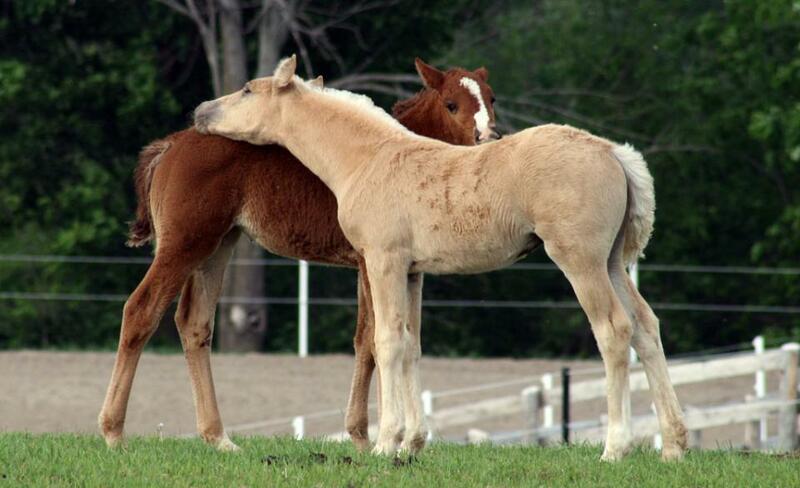 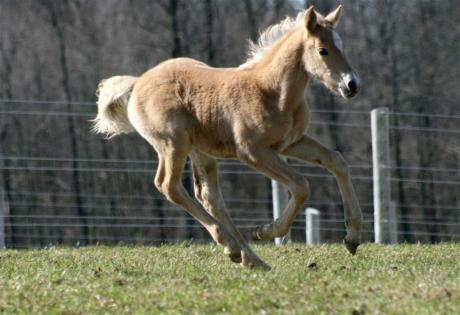 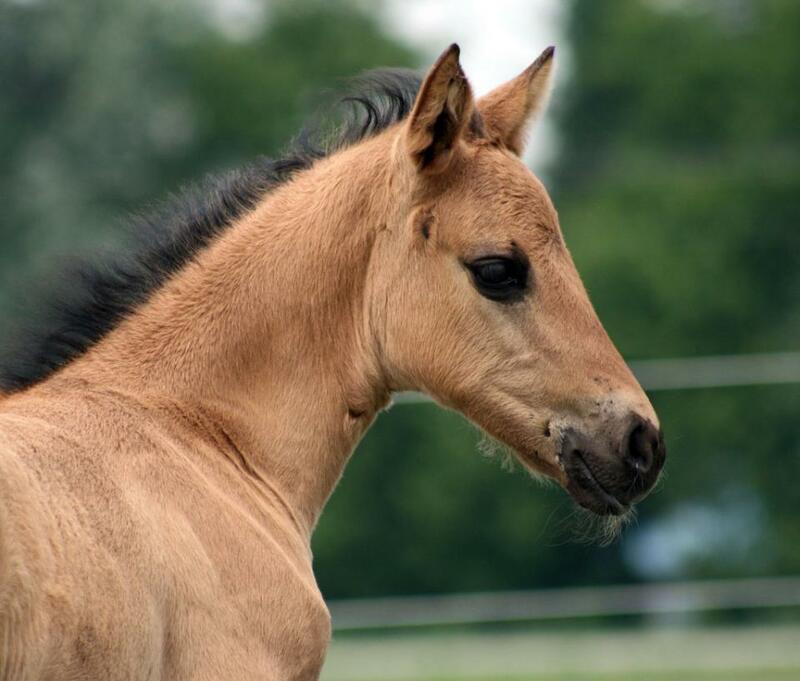 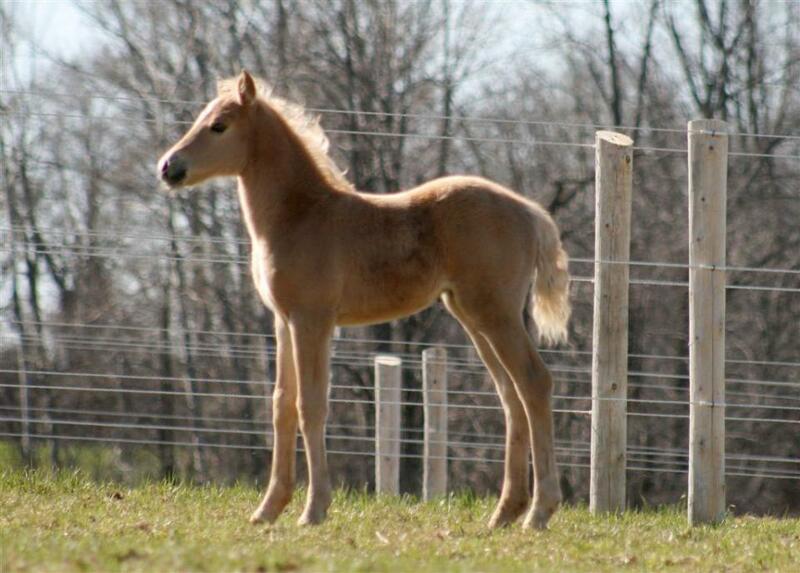 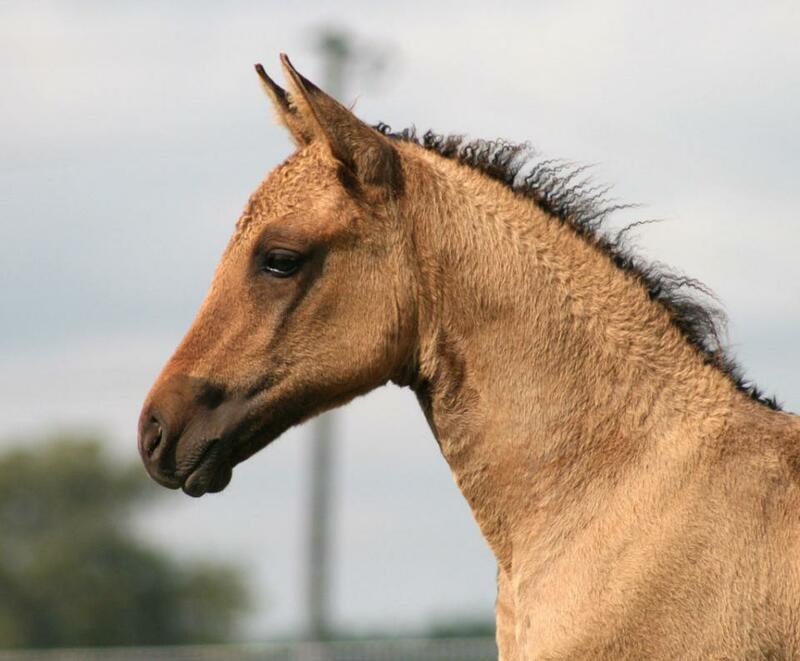 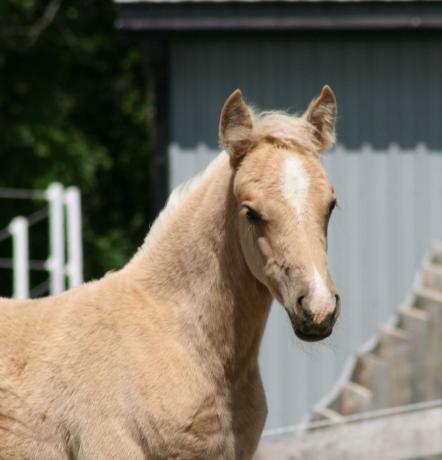 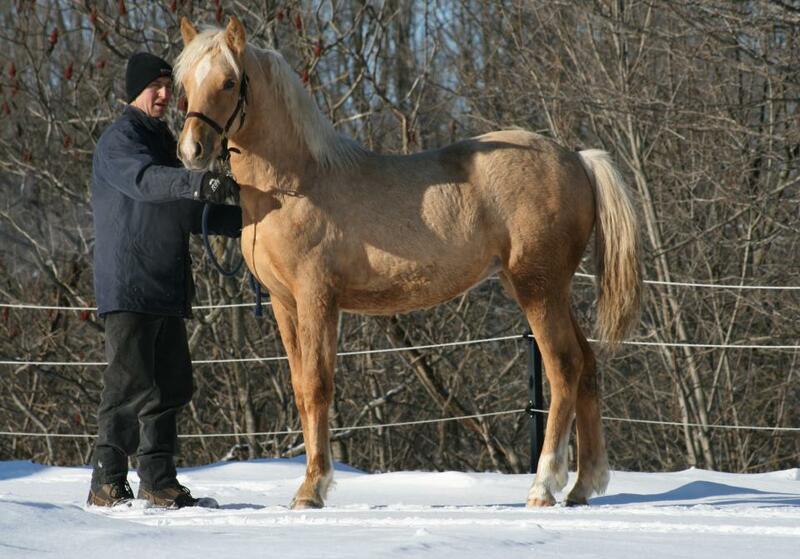 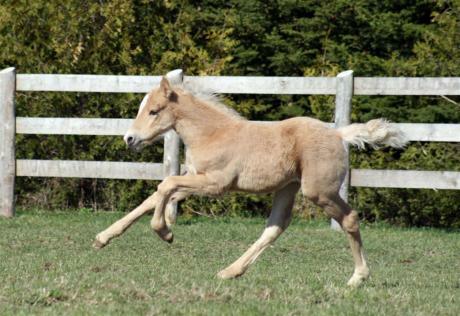 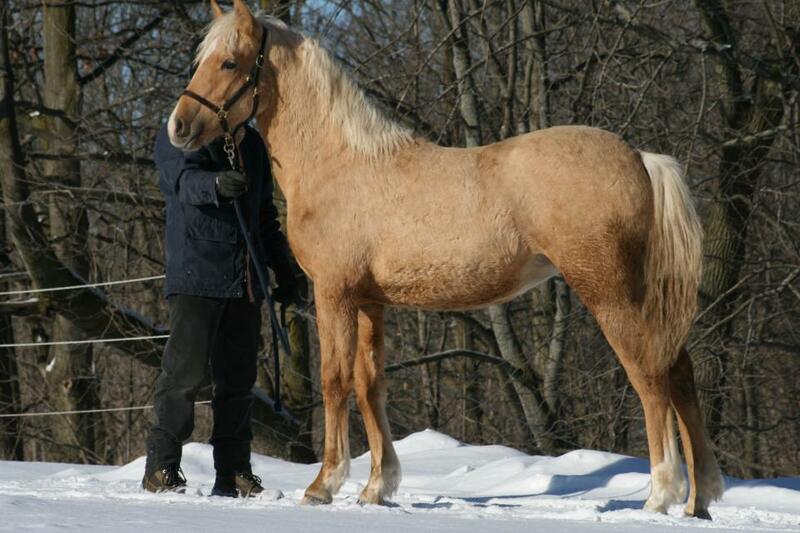 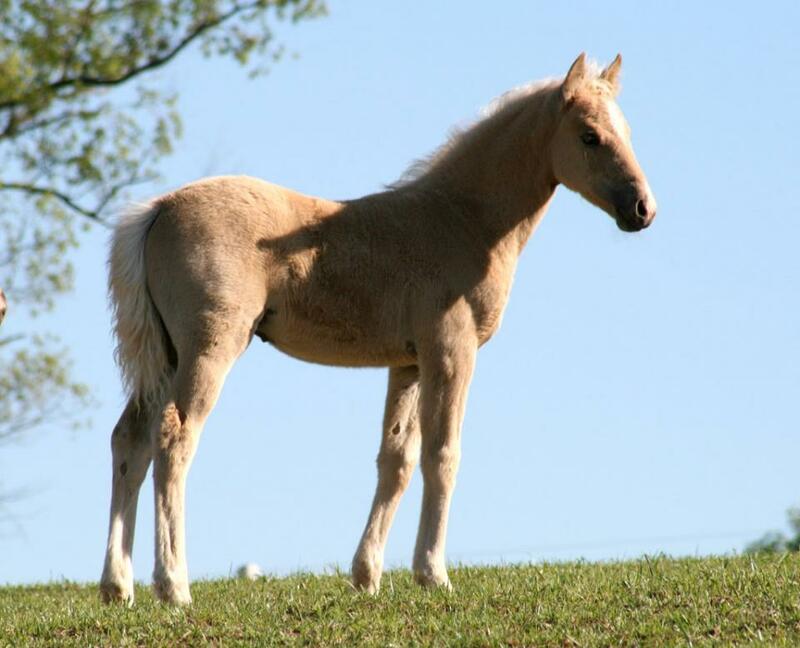 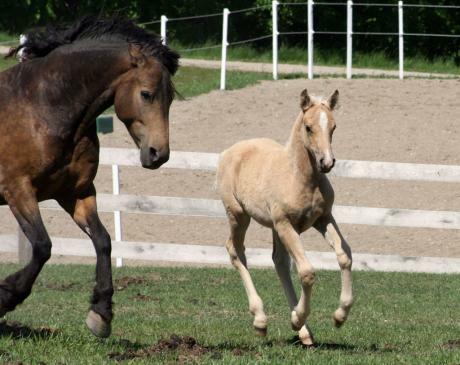 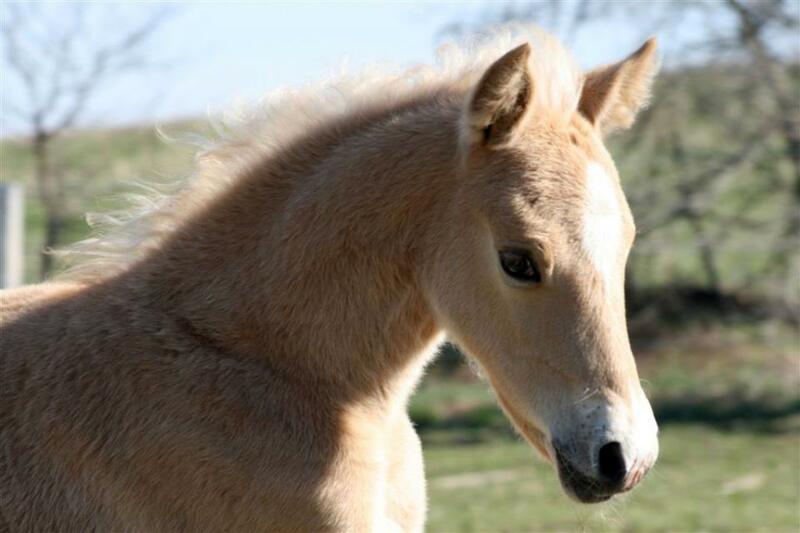 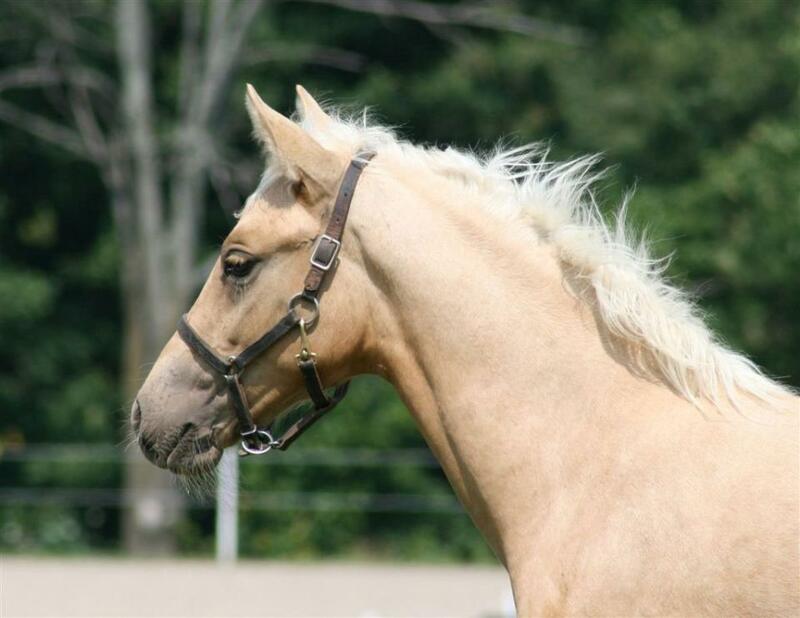 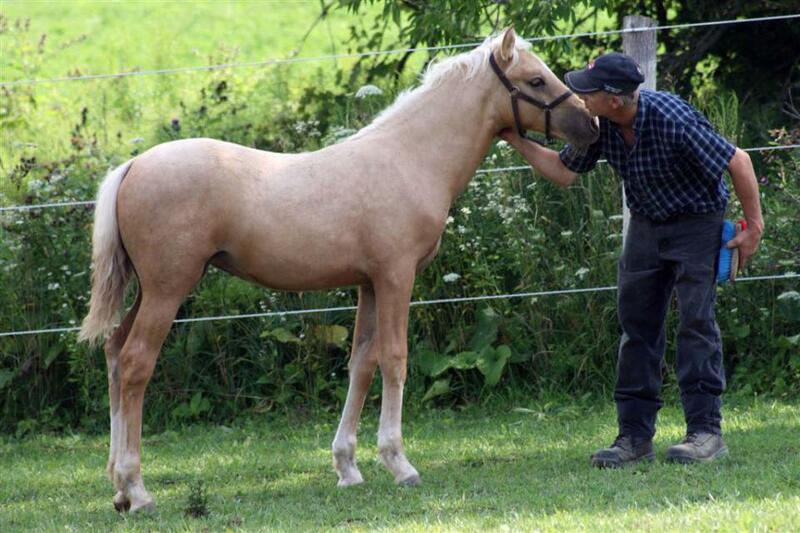 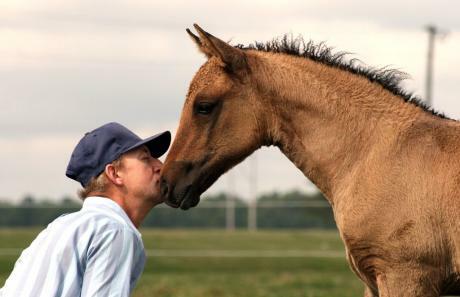 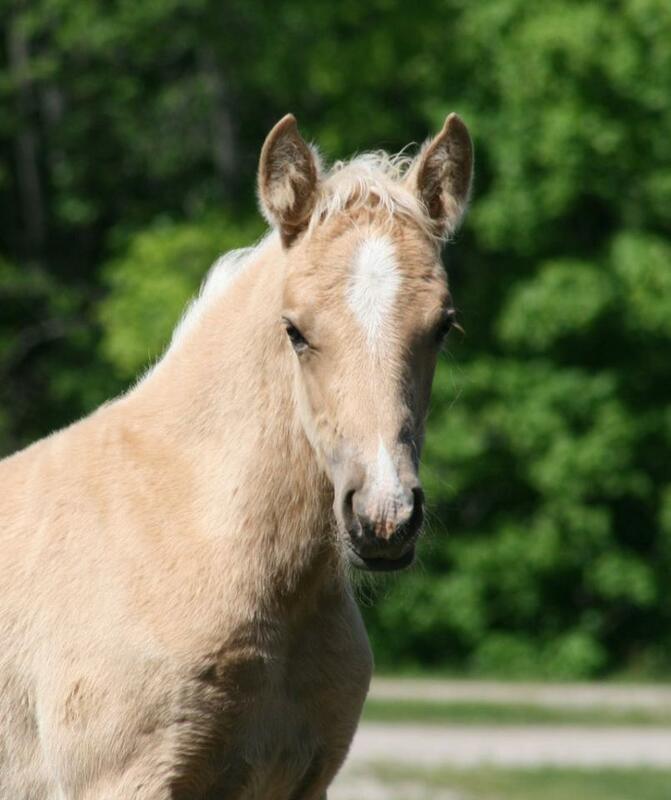 Seneca is a beautiful palomino filly in body, soul, and spirit. 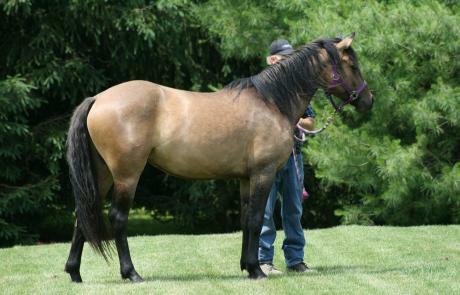 Her coat is straight with some swirls in her mane and tail. 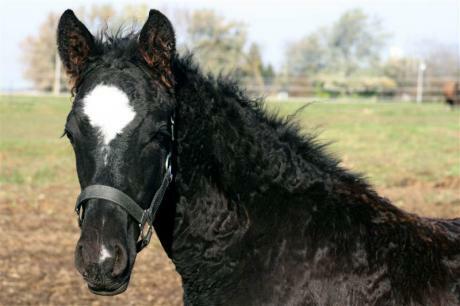 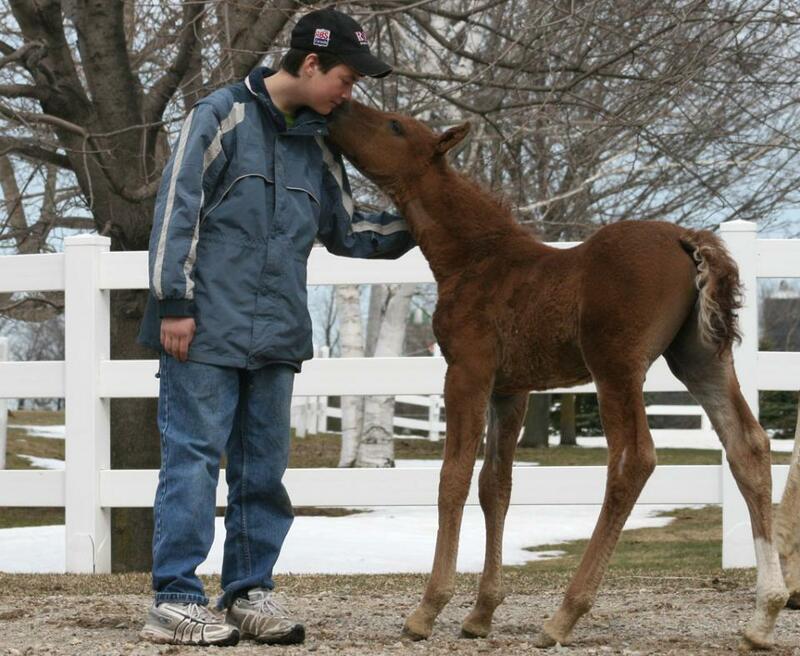 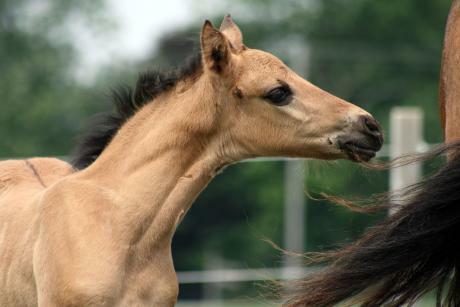 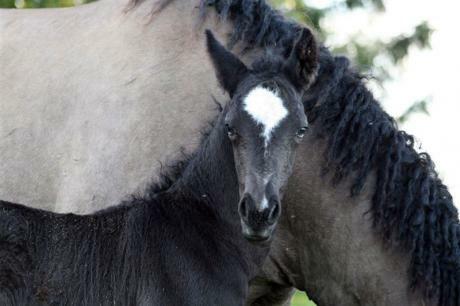 She is one of the most friendly and sweetest foals yet. 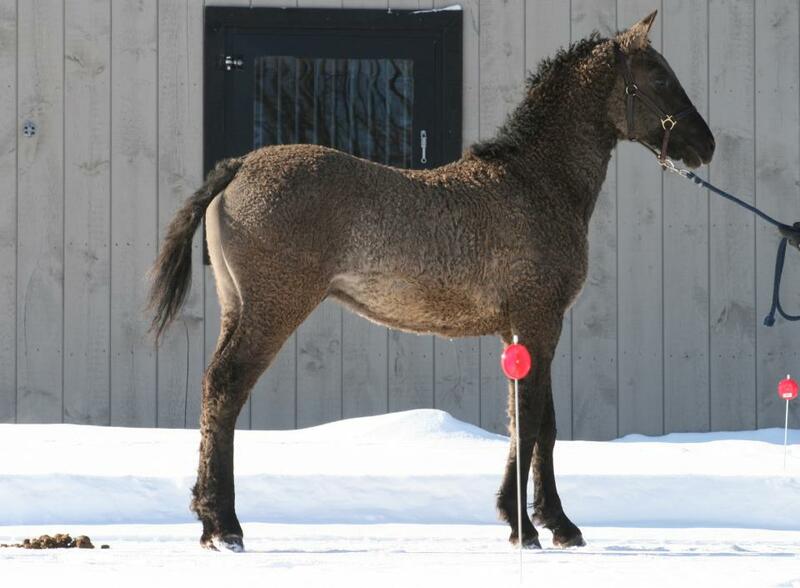 Lots of presence and confidence along with a very correct conformation. 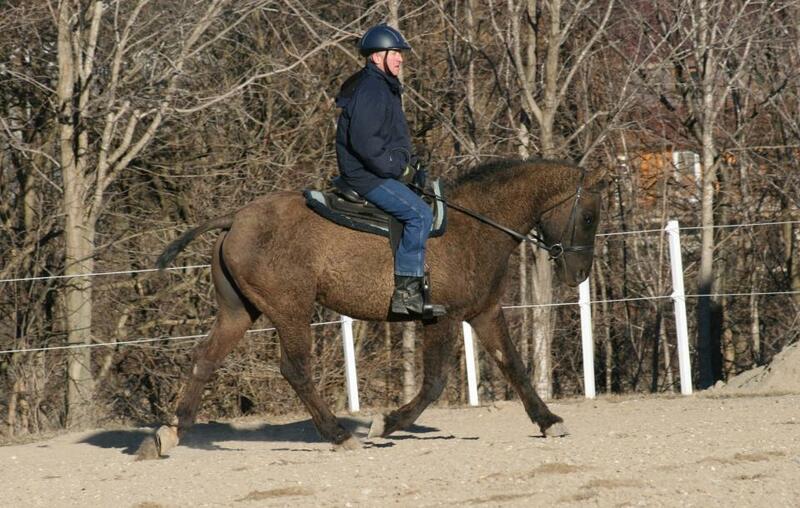 Seneca has the movement to make a lovely dressage horse. 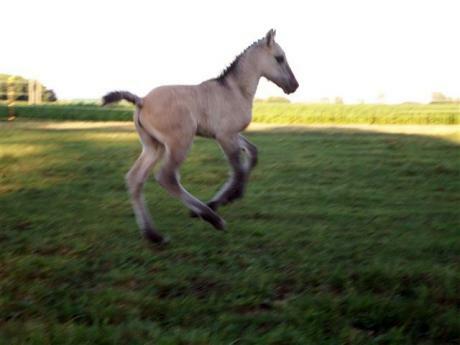 We expect her to mature at 15.3 hands. 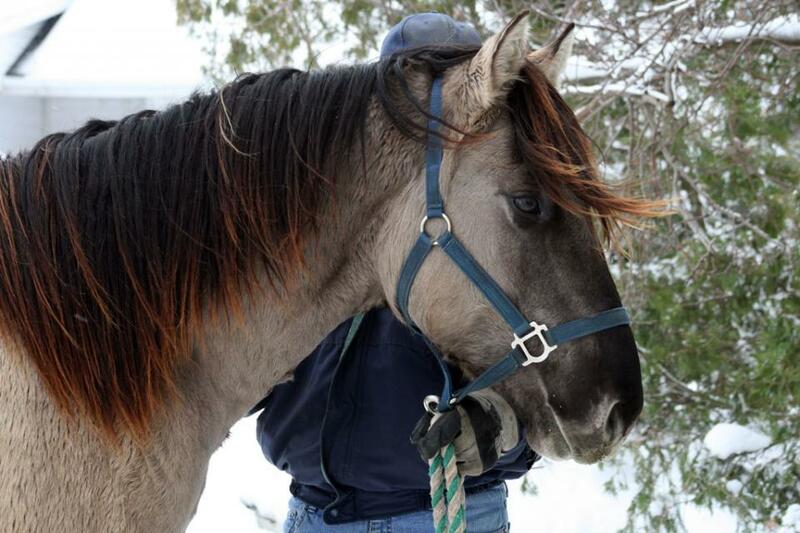 Azure has the looks, style, and temperament to make a handsome stallion some day. 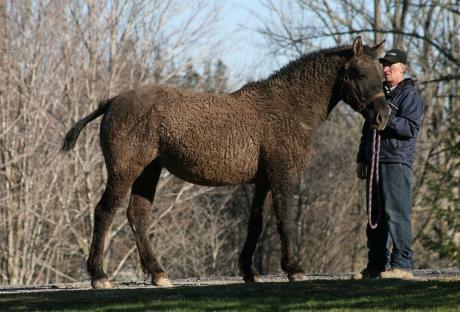 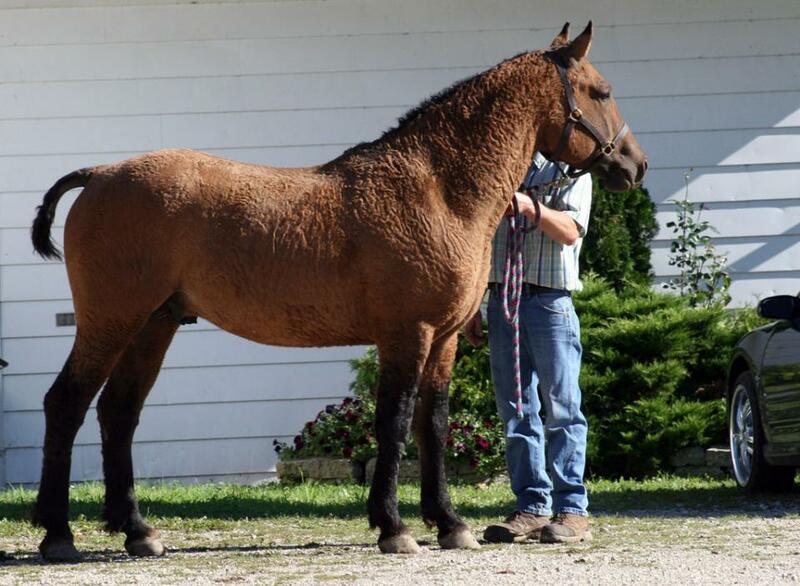 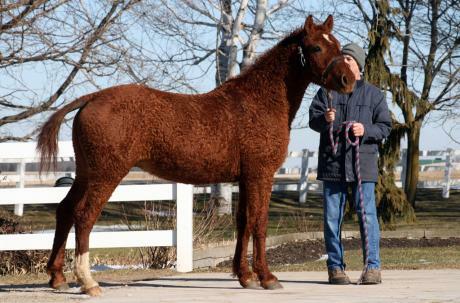 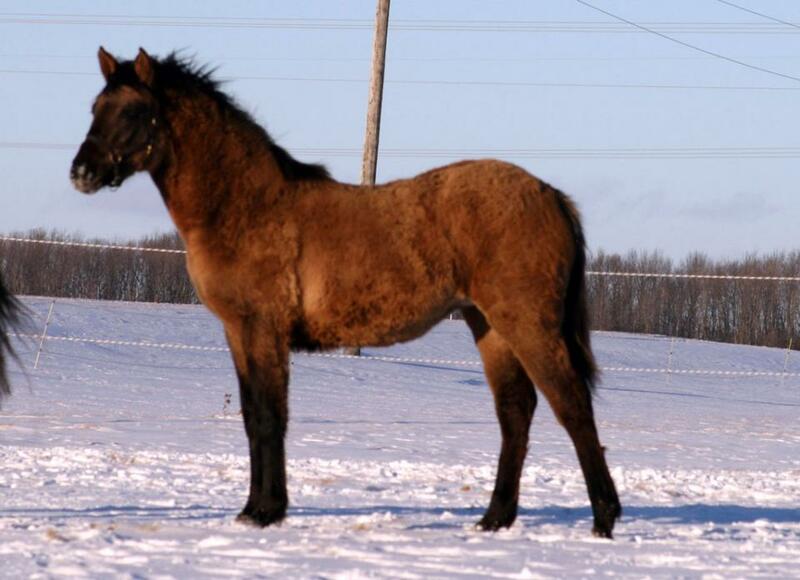 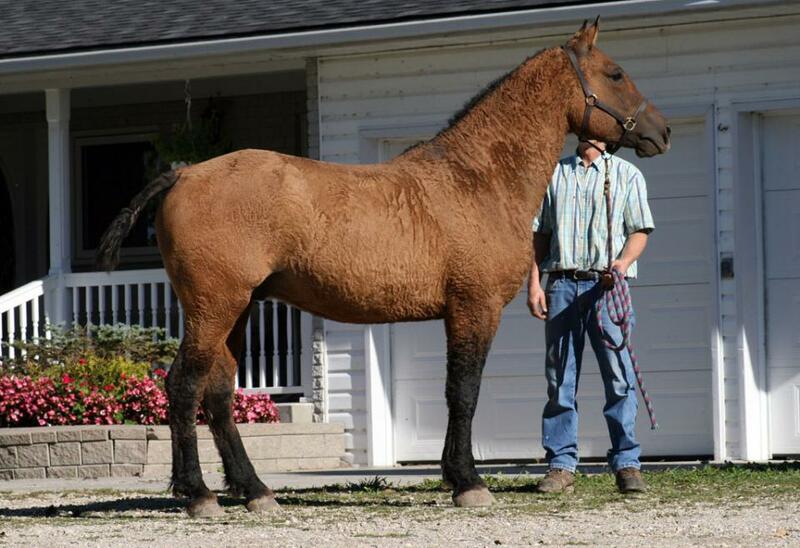 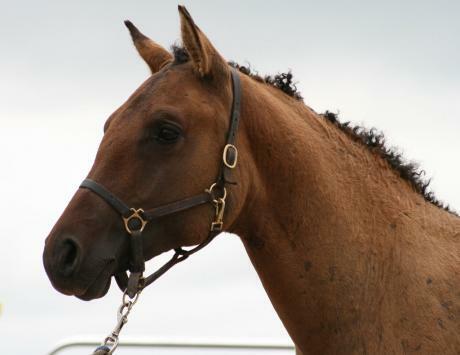 He is a rare grullo colour with curls and will have a full mane & tail. 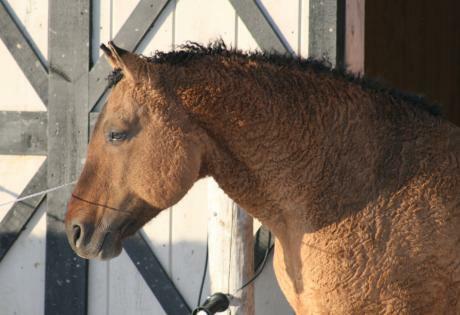 He tries hard to please his human friends, although he can't help from being just a little mischievious at times. 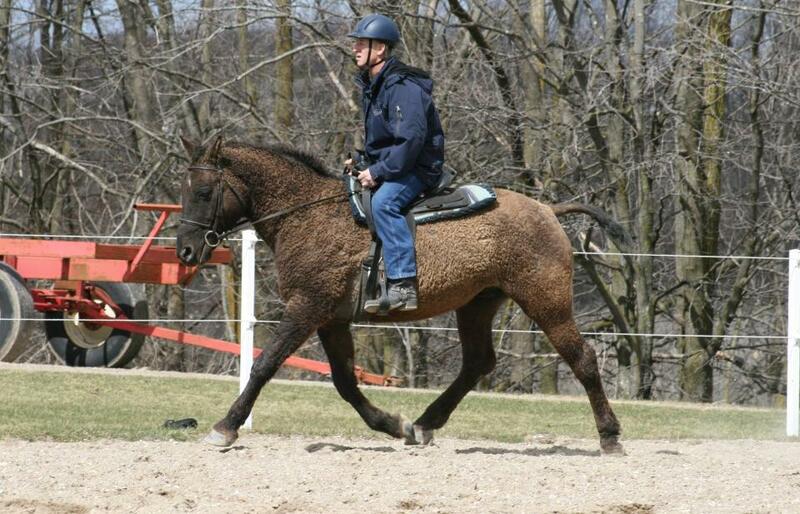 Very nicely put together with forward movement make Azure a promising sport horse prospect. Jet Star is a black curly coated colt with lots of presence. 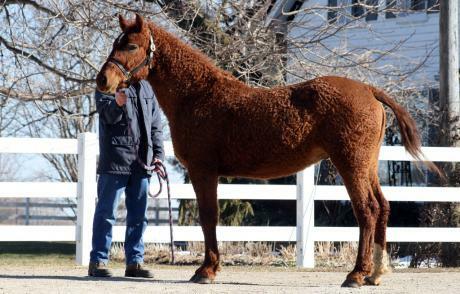 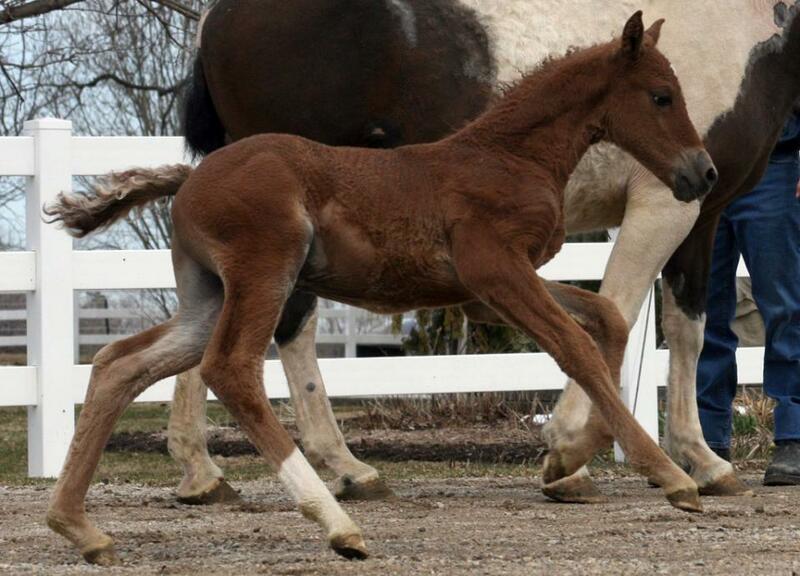 It looks like he will be a true black like his sire, *Mead's Aishihik Twist. 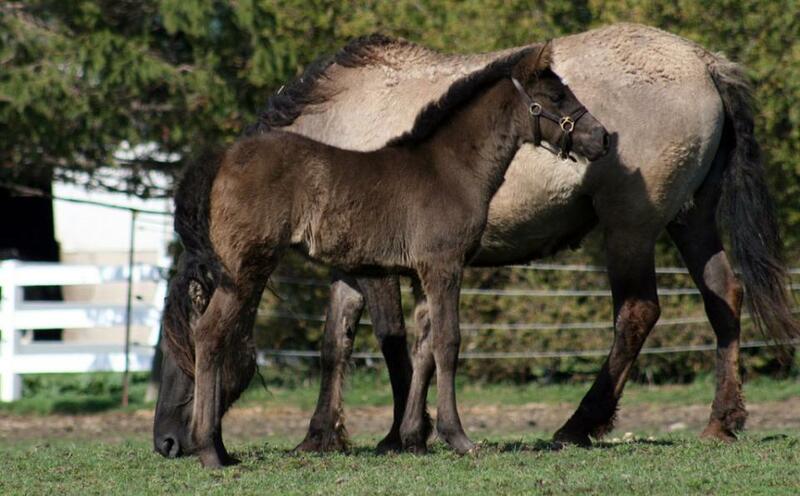 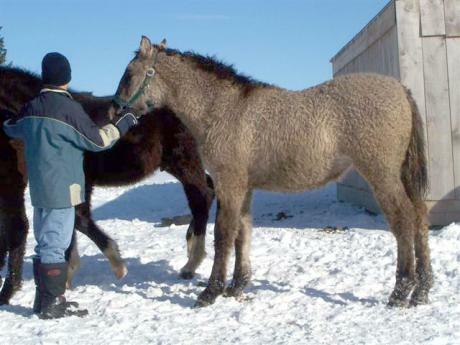 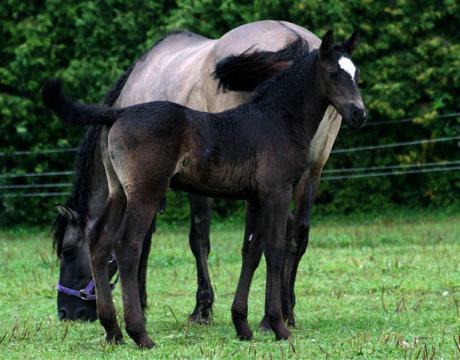 Jet Star's dam is *Mead's Spirit Lake Grulla, a mare which has proven to pass size and her pretty head unto her offspring. 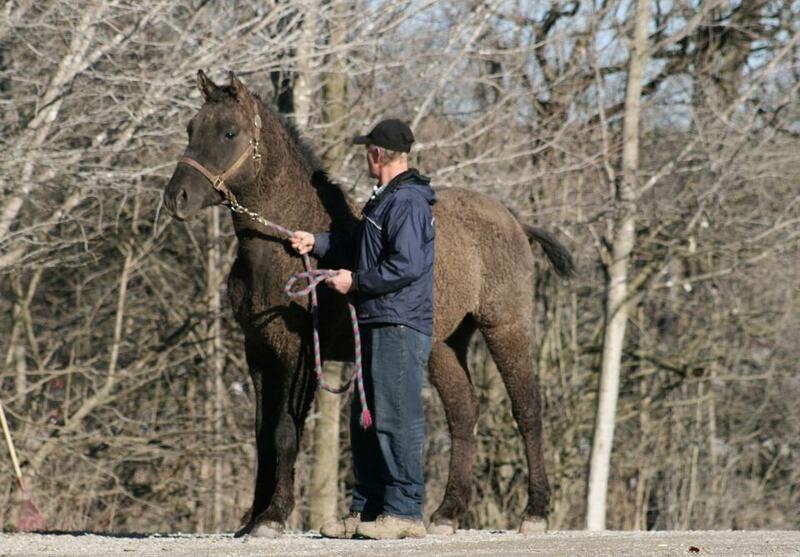 We expect Jet Star to mature at 15.2 to 15.3 hands. 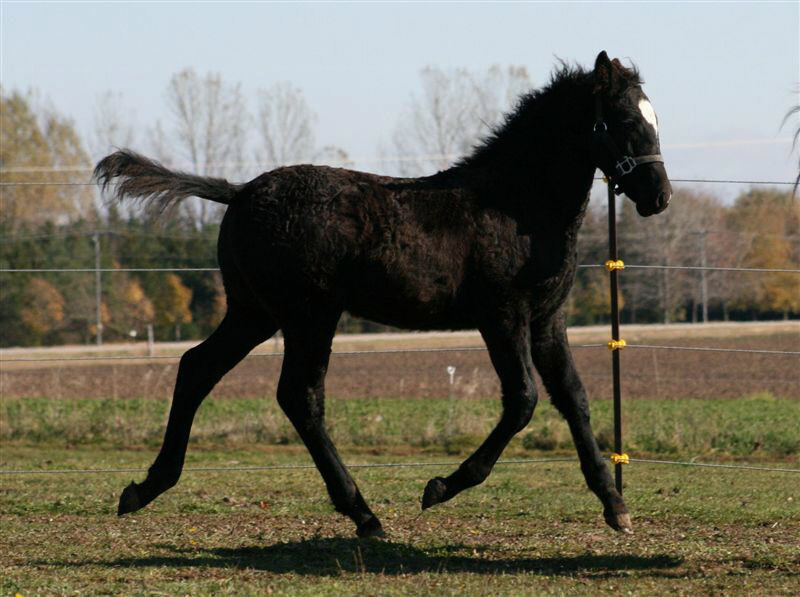 He is very athletic like his sire and has a bold, fearless, curious temperament. He often manages to be the first to meet his human friends for his share of love and attention. Jet Star has a handsome sculptured head, very long legs, and lots of suspension in his trot. 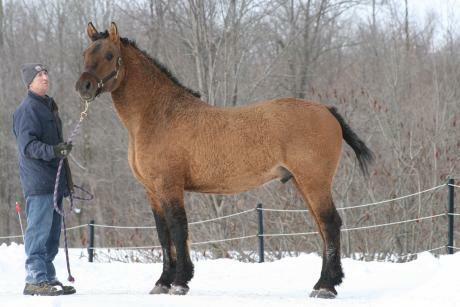 He would make a handsome dressage horse, jumper, and herd sire. Jet Star keeps lots of mane and tail. 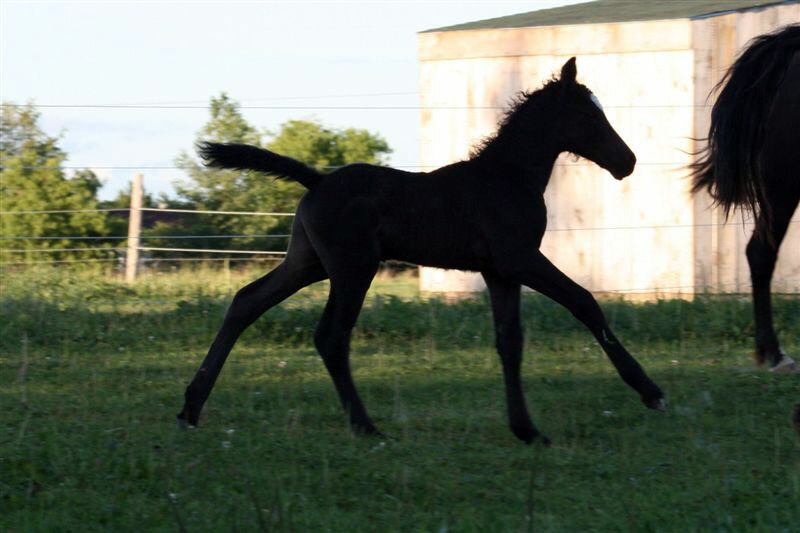 Jet Star has been DNA colour tested and is homozygous for black! 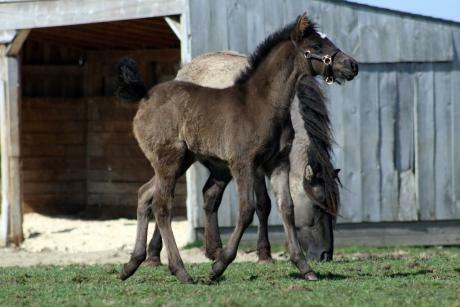 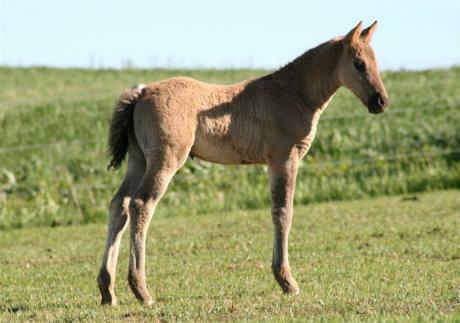 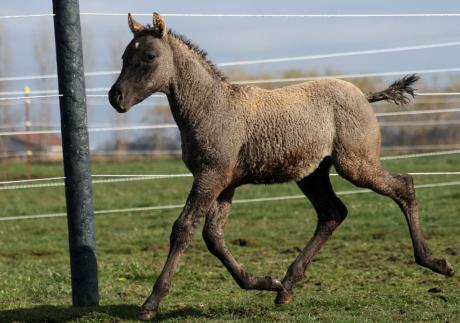 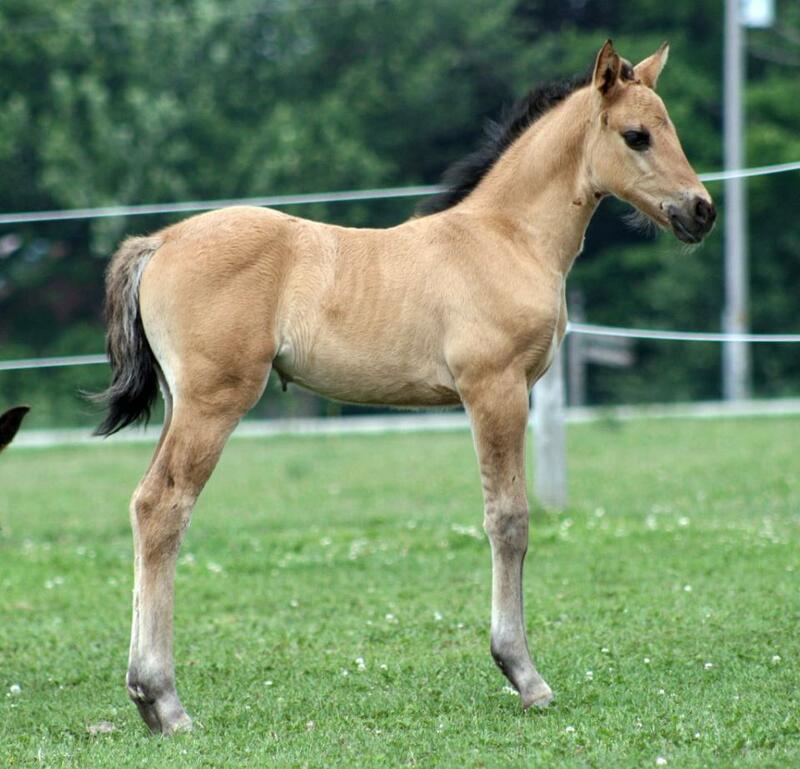 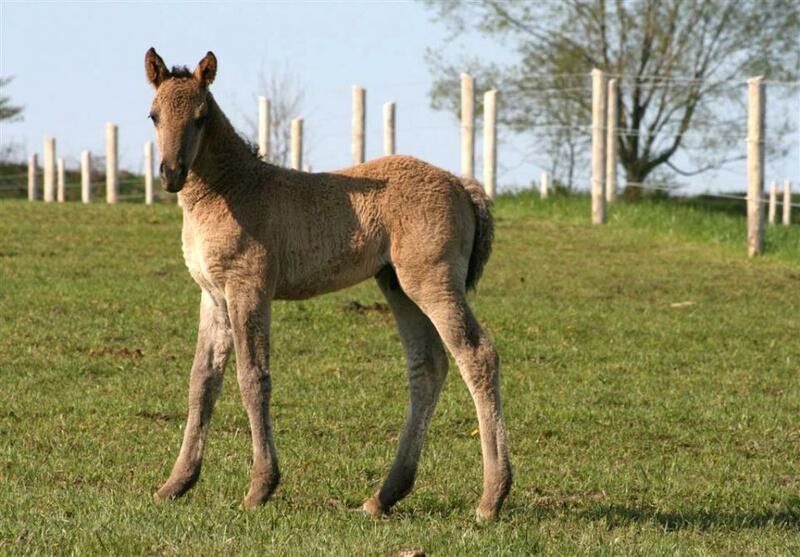 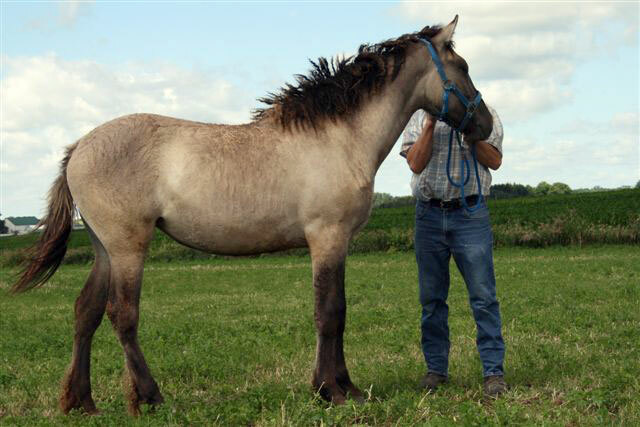 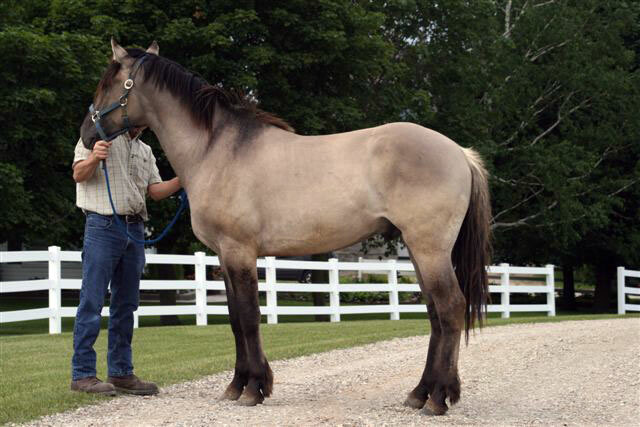 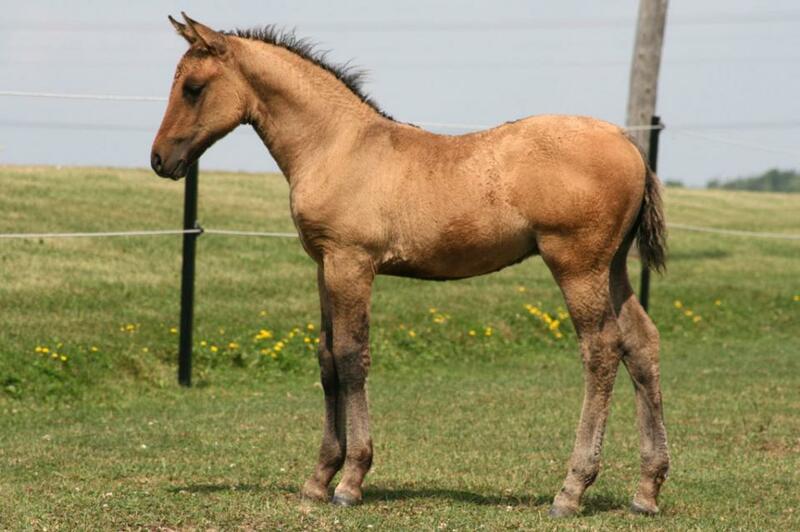 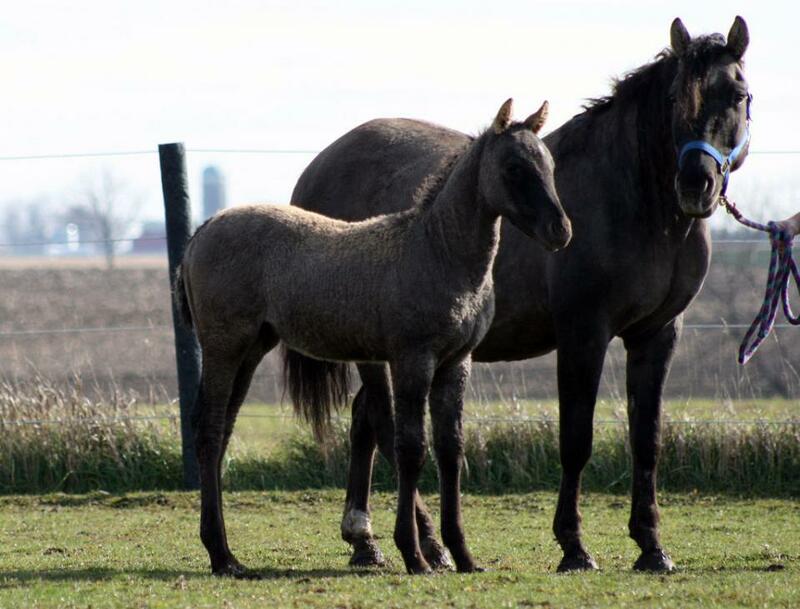 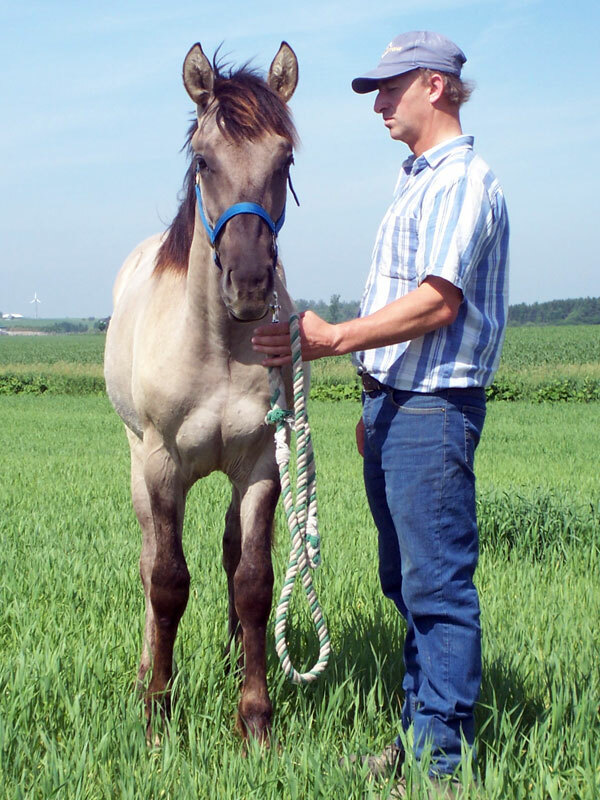 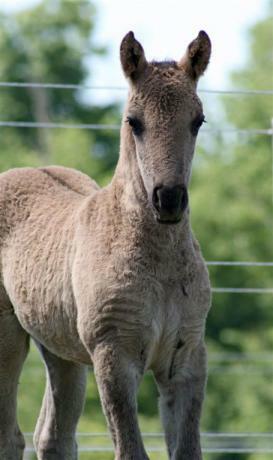 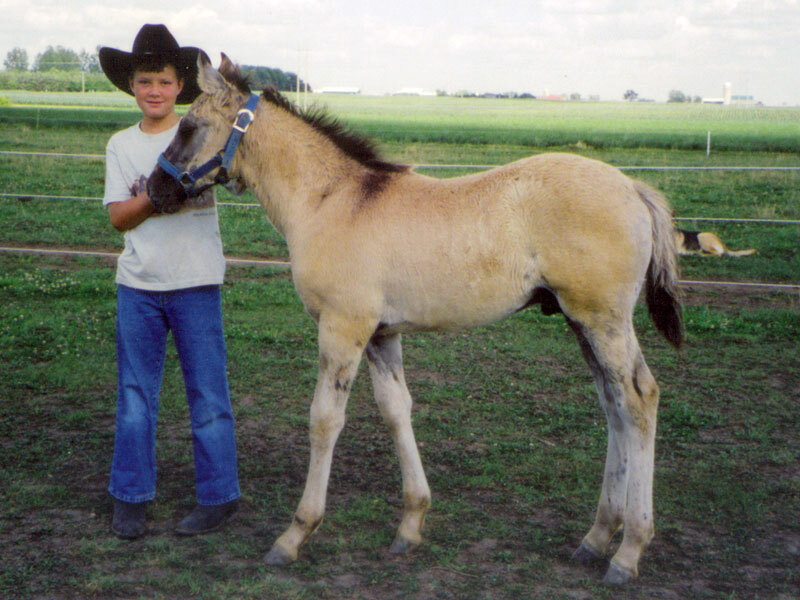 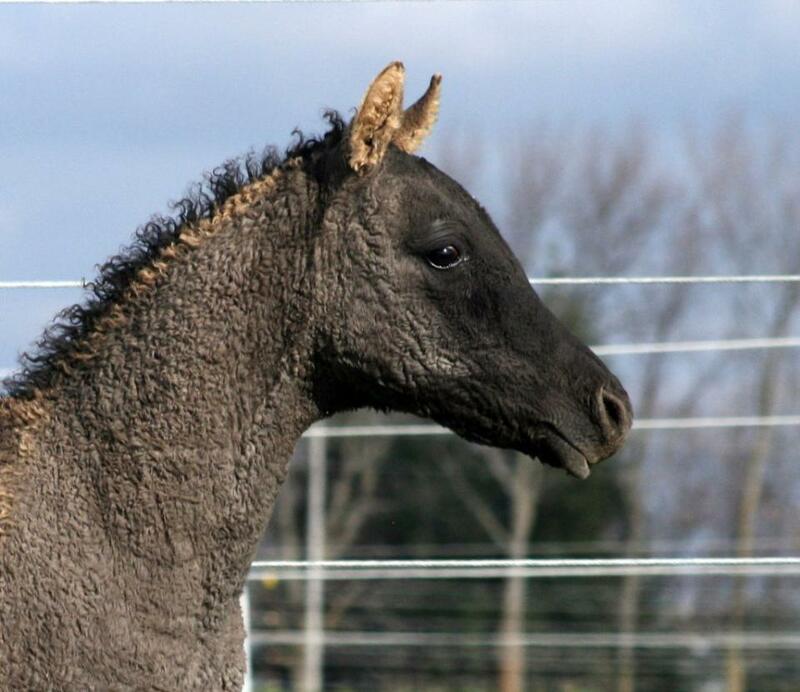 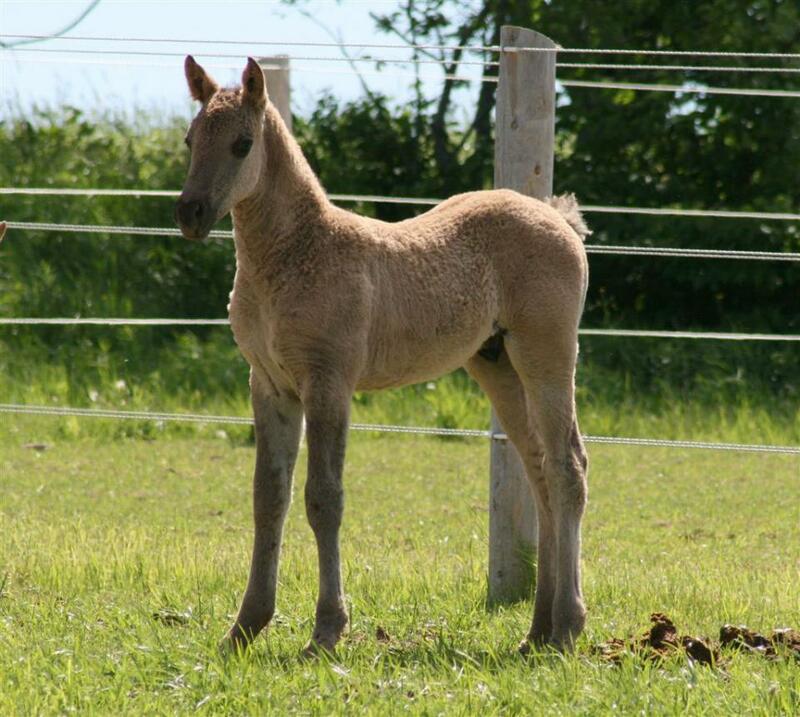 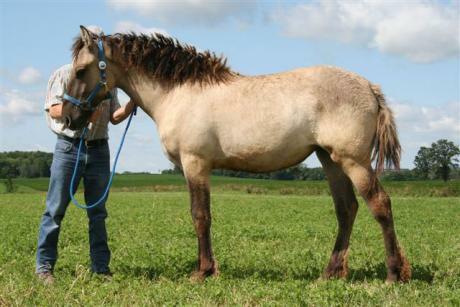 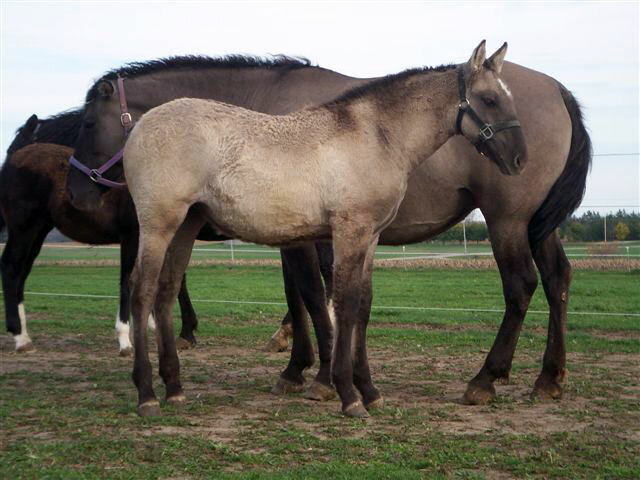 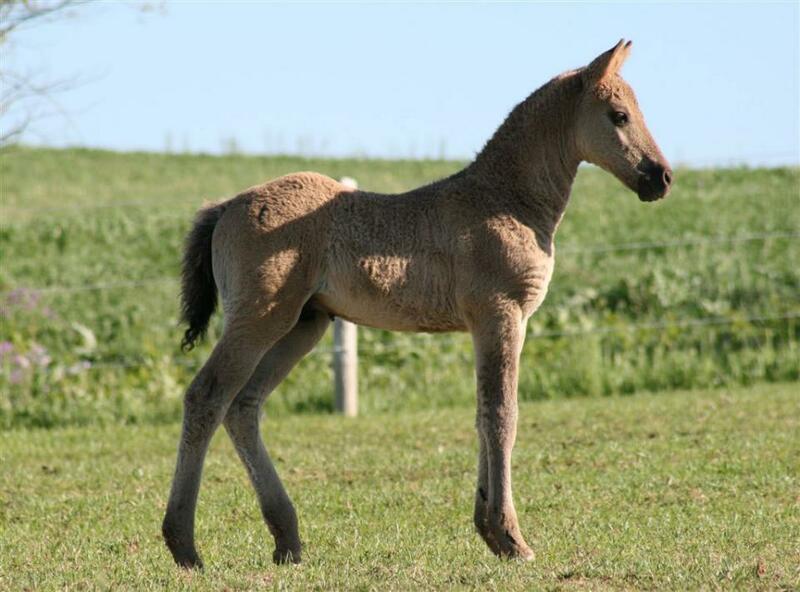 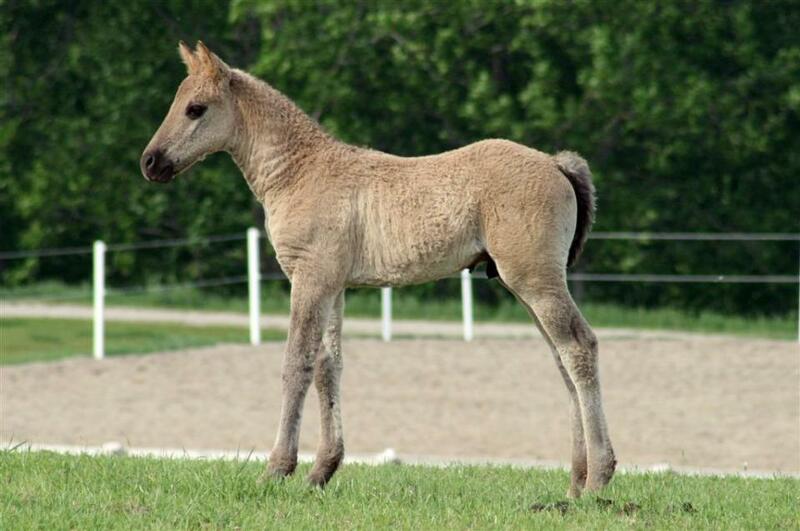 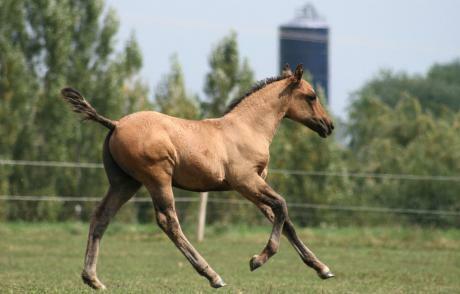 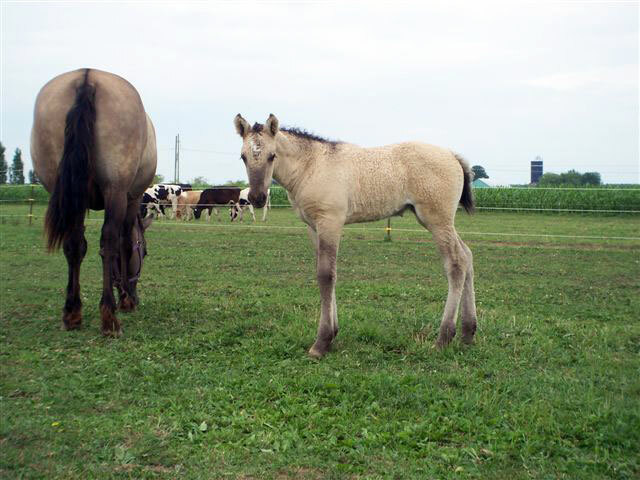 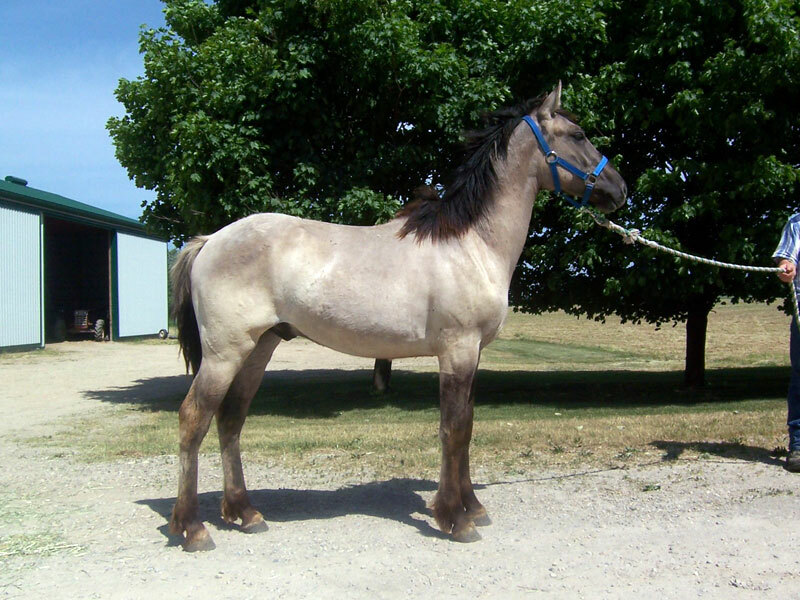 This curly, grulla fillie has a white star, is put together correctly, and has her sire's movement. She is expected to mature from 16-16.1 hands according to her cannon bone measurement, her size now, and that of her parents. 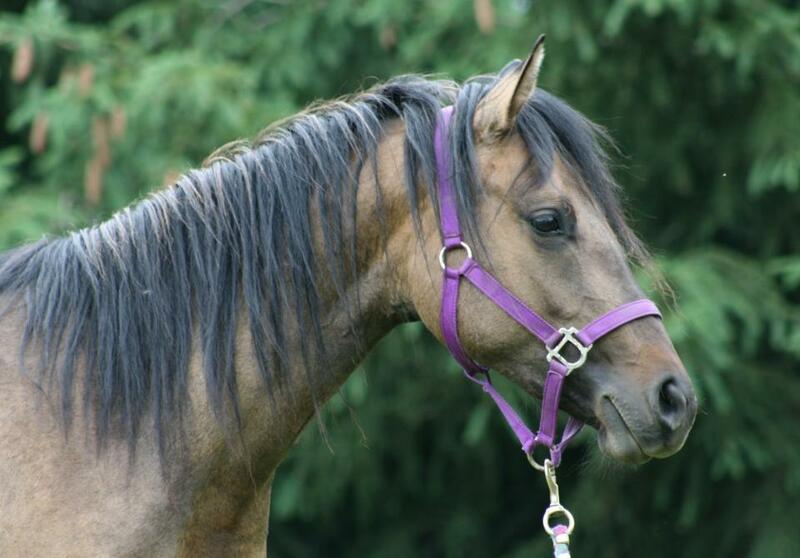 Brooke has a very sweet temperament to go with her other strong qualities. 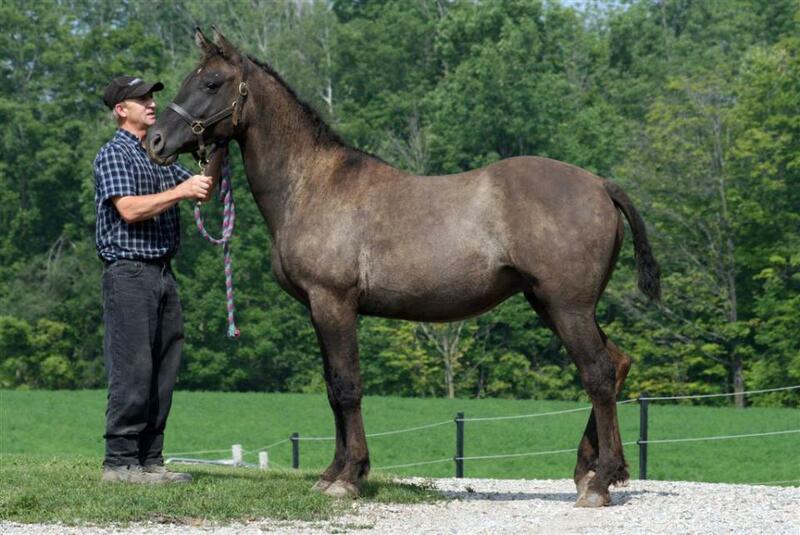 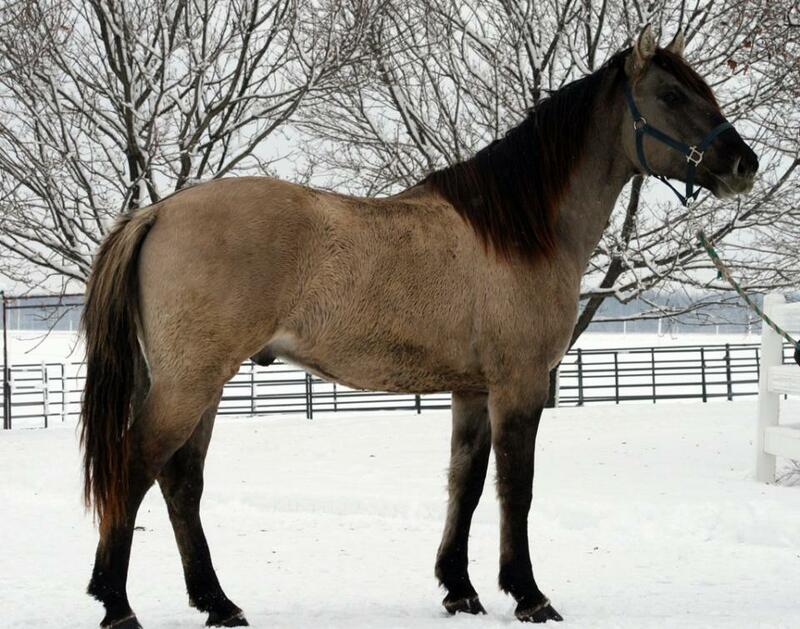 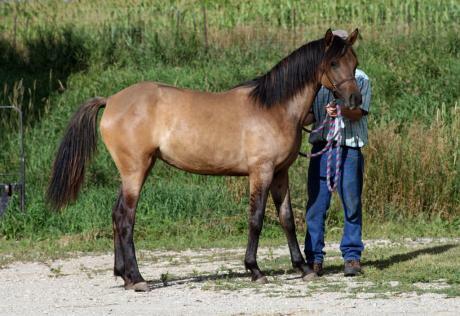 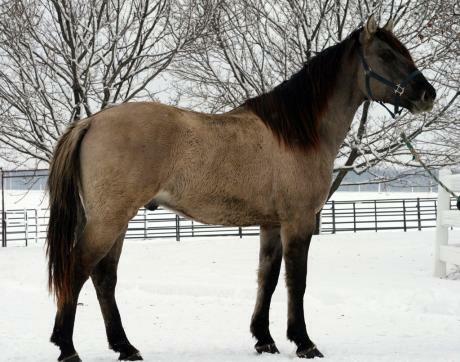 Charmer is a handsome grulla gelding with a dorsal stripe, leg baring, and cobwebing on his face. He has a small, refined head and is very well put together. 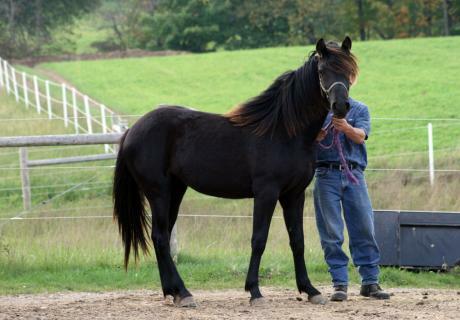 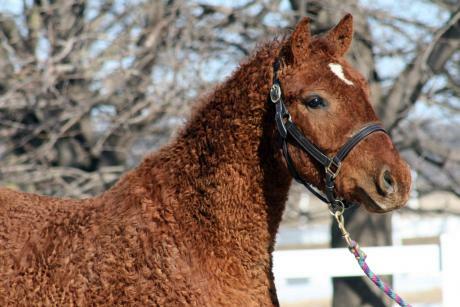 He has a long split mane, long tail, curls in his ears, and minimal body wave. He is full of presence with 40 stars in his pedigree. 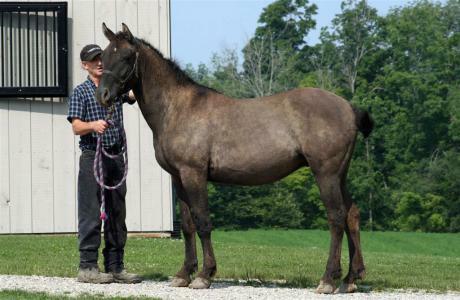 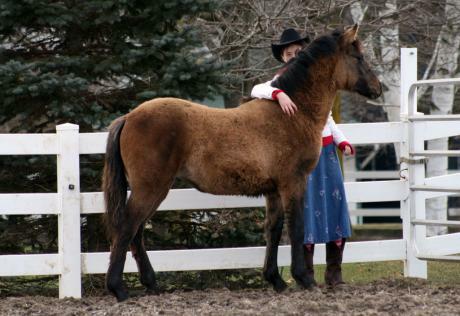 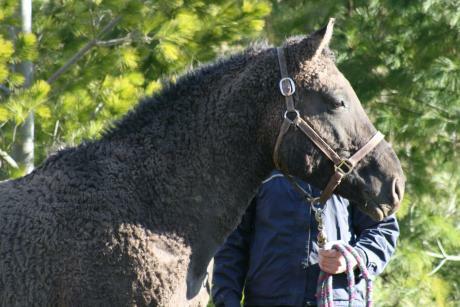 Like all of our horses, he loves attention, and is expected to mature at 16 hands. 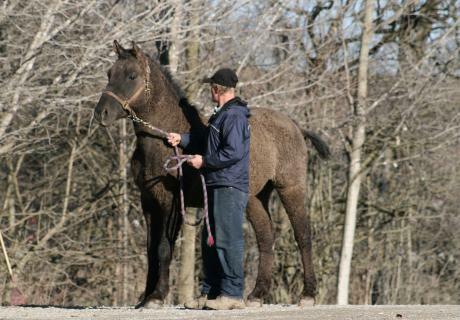 Charmer measures 15.1 hands as a 2 year old.